Paddy and I were heading to Denmark in 2017, my first time visiting the country since spending a year as a high school exchange student back in 1997-98. During my exchange year I visited Norway twice with my host family, but never made it to Sweden. (Okay technically we drove through Sweden once in the middle of the night, but that doesn’t count). 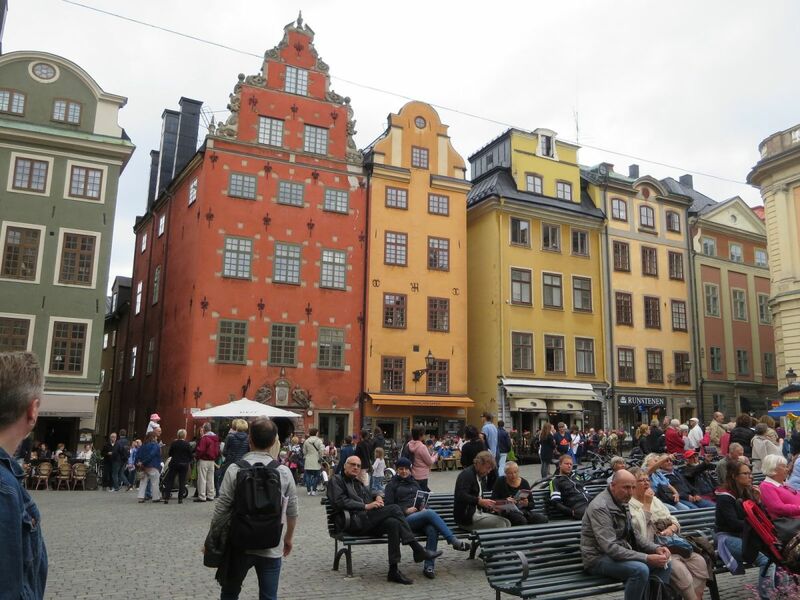 Since it was easy to book our flight into Stockholm and out of Copenhagen, we spent the first four days of our Scandinavian adventure in Stockholm. First, a note about Stockholm: Like the rest of Scandinavia, it’s EXPENSIVE. After a bit of research while planning this trip, I came to the conclusion that renting an Airbnb is hands-down the best way to go for lodging. I had a difficult time finding a hotel room in a good location with a private bathroom for under $200 USD per night. 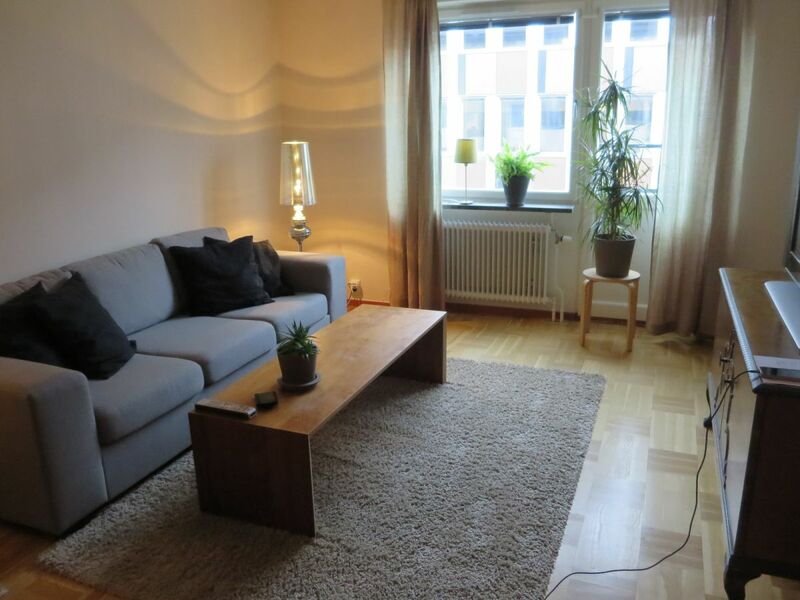 I was able to find us a one bedroom apartment in Södermalm (the southern, “hipster” neighborhood) in a great location near public transit for $150 a night. 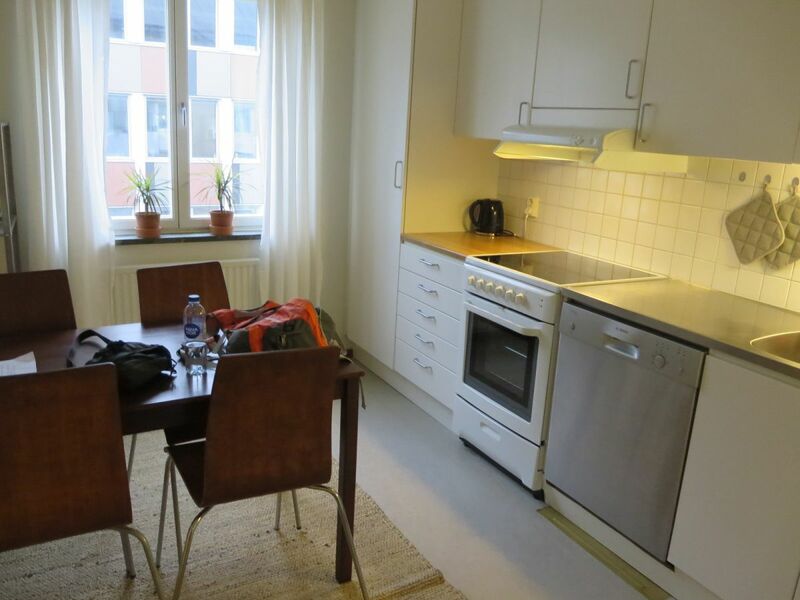 Not only did we get a full one-bedroom apartment all to ourselves, we had a full kitchen and were able to save a lot of money on breakfast and lunch through self-catering. 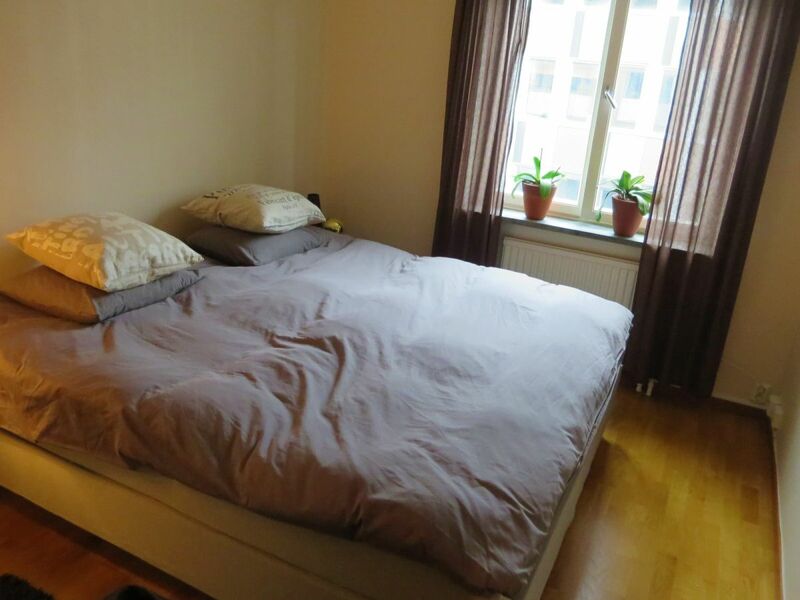 If you are looking to do Stockholm on a budget, Airbnb is definitely the way to go. We arrived in Stockholm in early evening after approximately 15 hours of travel from Seattle (10 hour Delta flight from Seattle to Amsterdam, and a two hour KLM flight from Amsterdam to Stockholm). We collected our luggage and after a fair amount of walking through the airport located the airport train station. *Side note about Delta’s long-haul international flights: I haven’t always had the best experiences with Delta’s domestic flights within the US, but we were surprisingly pleased with the international flight. The flight attendants were friendly, we were fed a hot meal and two snacks, had a wide array of free movies to choose from on individual seat-back screens, and we were provided with alcoholic beverages free of charge. We were even given hot towels at the beginning and end of the flight. The Stockholm Arlanda Airport train station (look for the Arlanda C signs in the airport) has three train options to choose from. There is the Arlanda Express, the high speed train between the airport and Stockholm Central Station downtown, the SJ train for long distance commutes outside of Stockholm, and the Pendeltåg commuter train which makes more stops throughout the city and south of the city. Since we were going past the city center to the southern Södermalm neighborhood, the Pendeltåg commuter train was the one we wanted, according to Google Maps. (The Google Maps app has become my most valuable app while traveling, it is great at figuring out public transportation almost anywhere). There were automated machines for tickets on the Arlanda Express and the SJ trains, but we didn’t see one for the Pendeltåg. We were able to buy our tickets directly from a ticket seller in the train station and pay with our credit card. 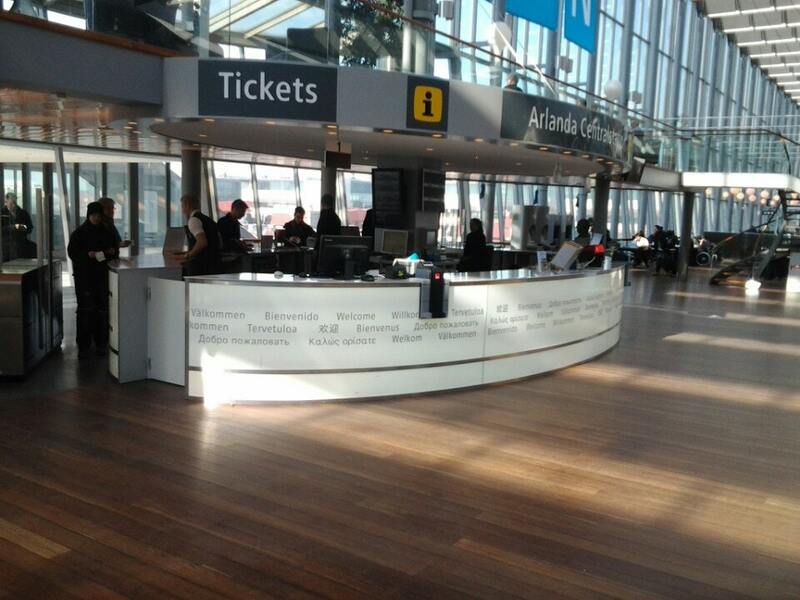 It was roughly $17 per person for the train tickets, including the airport transportation fee (120 SEK per person). The Pendeltåg took 40 minutes to get to Stockholm Södra station (twice the time of the Arlanda Express to Stockholm Central) but it was an easy ride. From Stockholm Södra station we used Google Maps to navigate to our Airbnb apartment on Högbergsgatan. It was a bit more of a walk than we anticipated, mostly because Google Maps took us through some sort of “short cut” through a couple parks and we got a bit confused. When we arrived at the apartment, our Airbnb host Marco was waiting for us with the key and made sure we were able to find everything we might need in the apartment. After unpacking and washing up, we were starving. We headed out in search of sustenance. 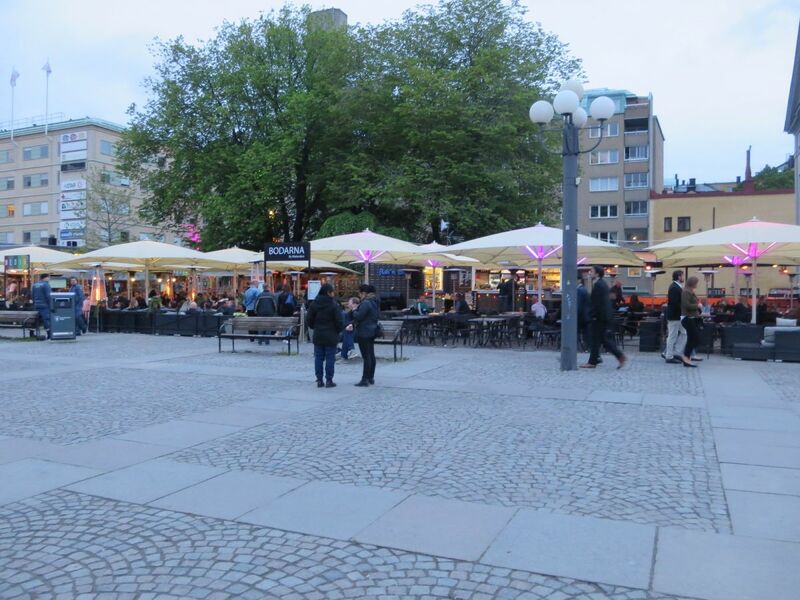 We walked over to the main arterial street Gotgatan and found ourselves eventually in Medborgarplatsen, or “citizen square.” It was about 8:00 PM on a Saturday night, and there were several outdoor eateries and beer gardens full of people getting their evening started. 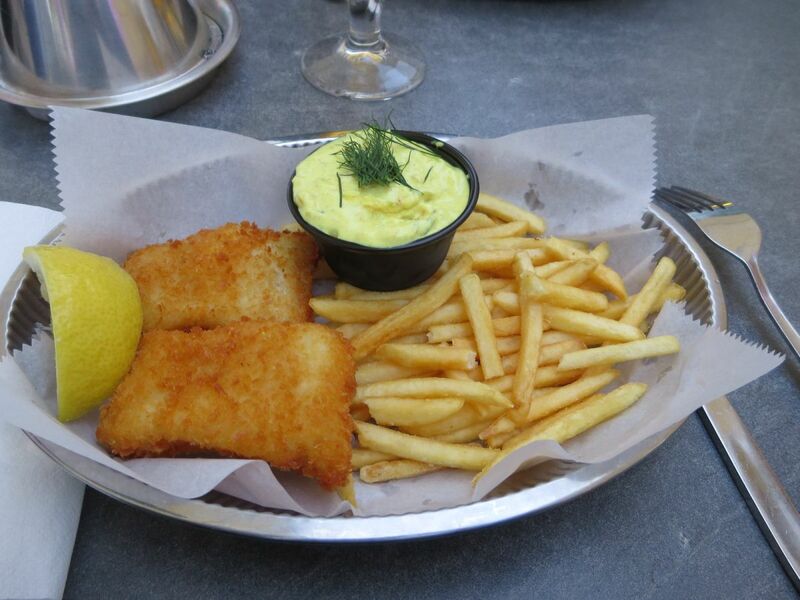 We looked at several menus and decided on fish and chips from Bodanra By Melander. Two relatively small portions of fish and chips and two beers ran us about $47.00 USD. More than we wanted to spend, but those are typical Swedish prices for you. The fish and chips were delicious, though, and came with a side of Danish curry remoulade. It was a nice evening, but not super warm. There were carts of complimentary blankets out for diners to keep warm. Nice touch. **Money saving tip: If you like to drink, bring booze with you. One of the most expensive things that you will encounter in Sweden is alcohol. A beer at a bar will run you between $7-$10 each, a glass of wine $10-$12, and a cocktail $15-$20. Sweden imposes a high tax on alcohol, with the highest alcohol content incurring the highest tax (cocktails and hard liquor). Beers sold in the grocery stores are only allowed to be 3.5% alcohol. Beer with higher alcohol percentages and all other wines and spirits are sold only at Systembolaget state-run liquor stores. These stores are closed on Sundays and in the evenings. Having read this before traveling, we brought box wine with us from home. According to the Swedish customs website, you are allowed to bring one liter of spirits or four liters of wine per person into the country. Box wine packs well in a suitcase and fits four bottles of wine per box. We like the Bota Box brand. It’s cheap, but decent quality. After our $47 fish and chips and beer, we headed back to the apartment to have a couple glasses of our box wine before bed. We stopped at the grocery store near our apartment building and picked up some bread, cheese, and other items for breakfast in the morning. We found the Swedish grocery prices to be very reasonable, and not much different from in the US. **Regarding tipping at bars and restaurants: It isn’t customary to tip in Stockholm, which helps ease the pain of the high prices a bit. It isn’t uncommon however to tip for exceptional service. If you do tip your server, the standard tip is 10%. 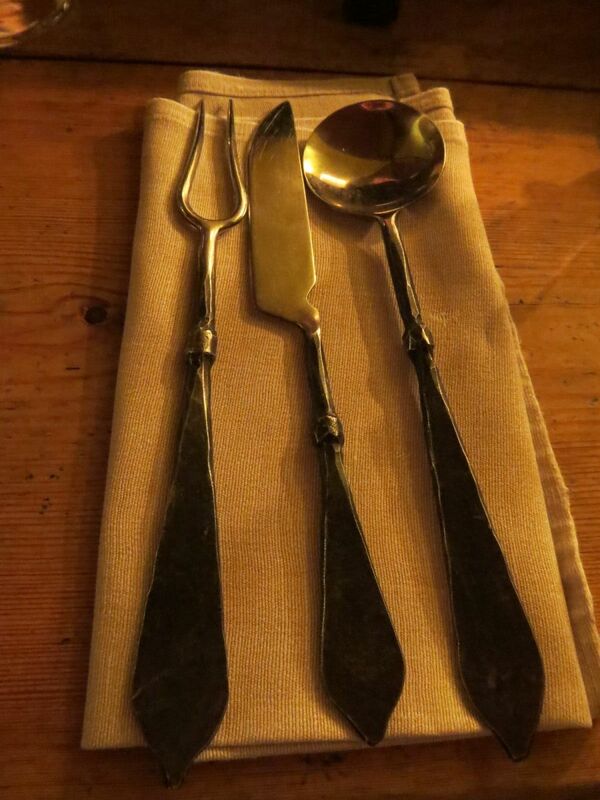 We tipped our server 10% at the two nicer dinners we had at this trip, as the service was very good. 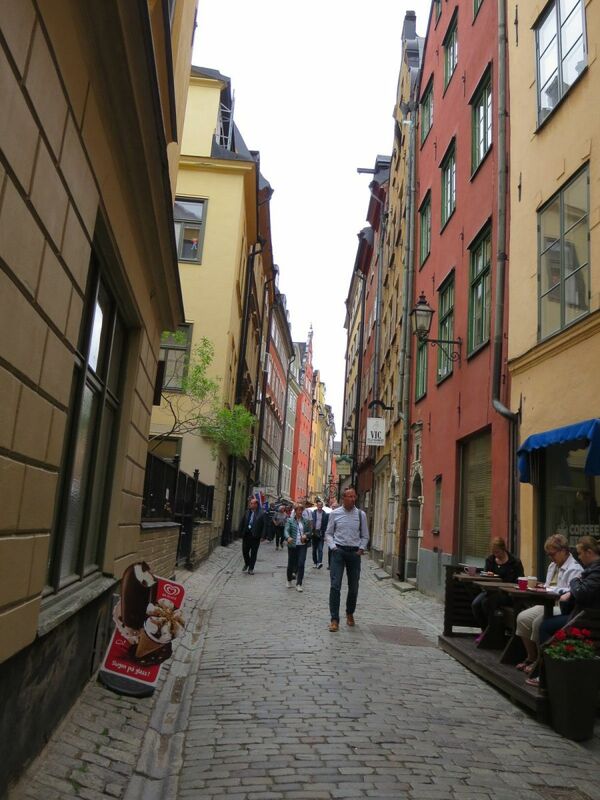 After making our own coffee and breakfast at the apartment, we were ready to go explore Gamla Stan. 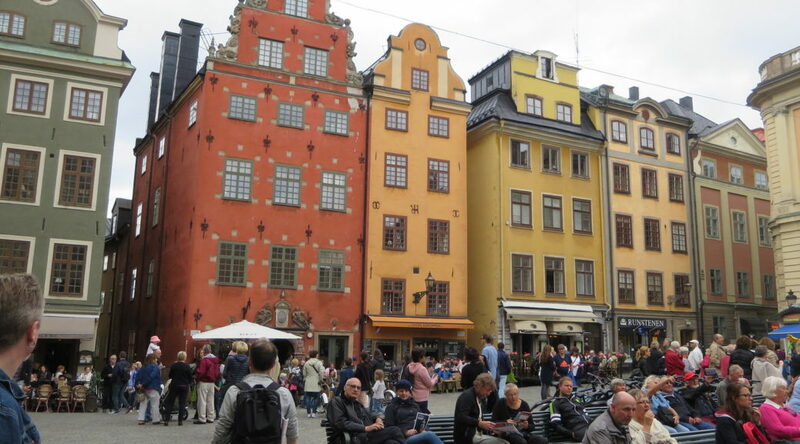 Gamla Stan is the original old town of Stockholm, dating back to 1252. The old buildings are well-preserved and it is one of the biggest tourist attractions in the city. If you are looking for quaint little shops and restaurants and souvenirs, this is the place to find them. 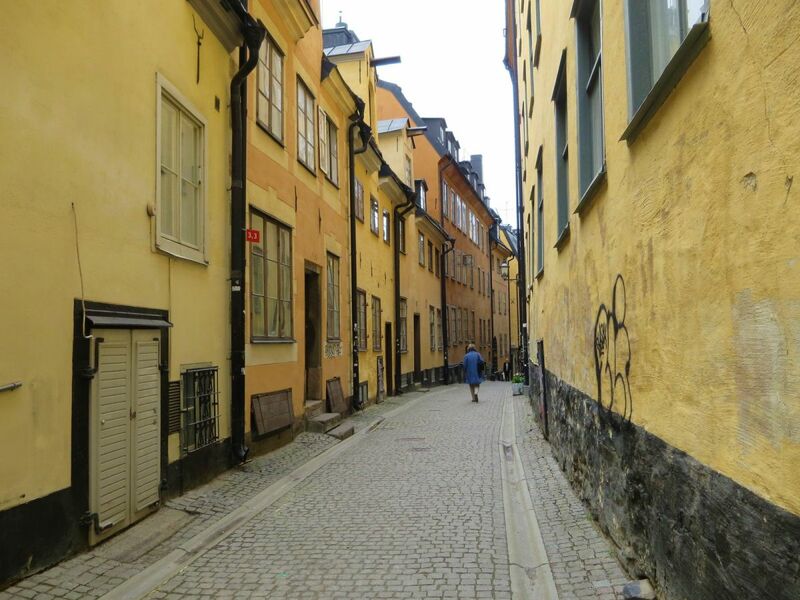 Gamla Stan was only a half mile north of our apartment in Södermalm, so we were easily able to walk there. If you aren’t someone who is able to walk a lot, the T-Bana (Tunnelbana) subway train is a good option from most parts of the city. It can get pricey for single-use tickets, however at $5.00 USD per person per ride. The train is very easy to use, and you can buy tickets with your credit card from any of the electronic kiosks available when you enter the underground stations. We wandered through the narrow medieval cobble-stone streets until we ended up on the north end of Gamla Stan in front of the Royal Palace. 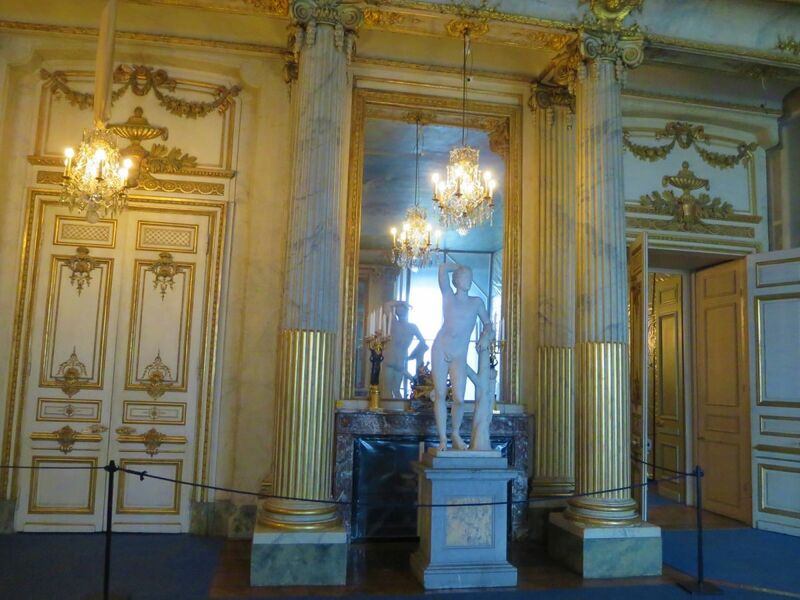 The Royal Palace wasn’t too crowded, so we decided to check it out. If you are someone who is interested in European monarchies and history, this would probably be a good attraction for you. 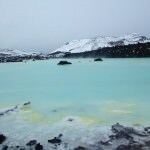 It was interesting, but not the highlight of our trip. There are several sections of the museum to explore, but we just toured the Royal Treasury and the Royal Apartments. We started with the Royal Treasury as that is where you purchase tickets. 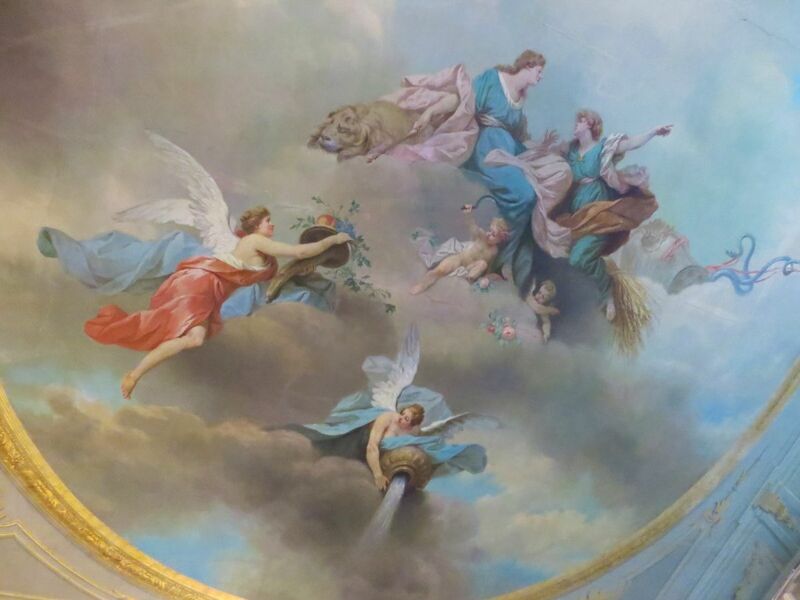 It was interesting to see all the royal crowns, sceptres, and orbs of past royal family members. 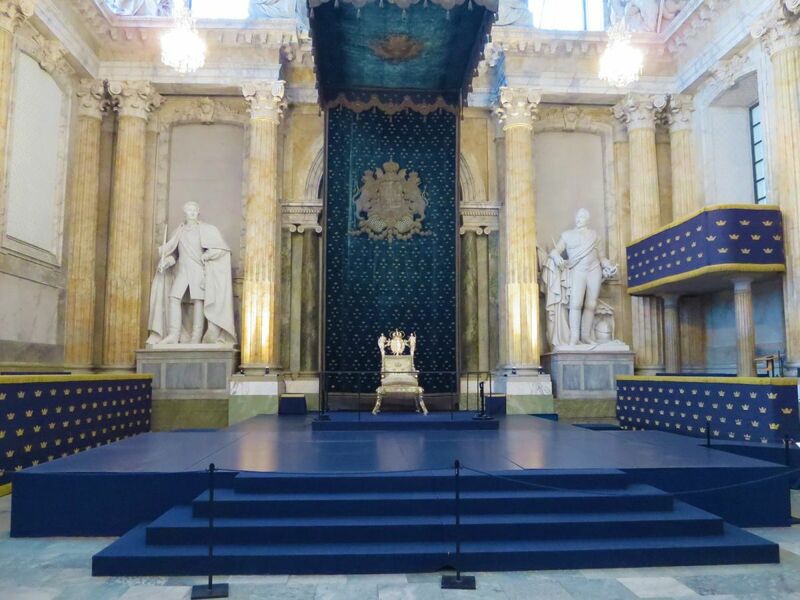 We moved on to the Royal Chapel and Royal Apartments. It was all very regal and somewhat interesting and worth a stop. 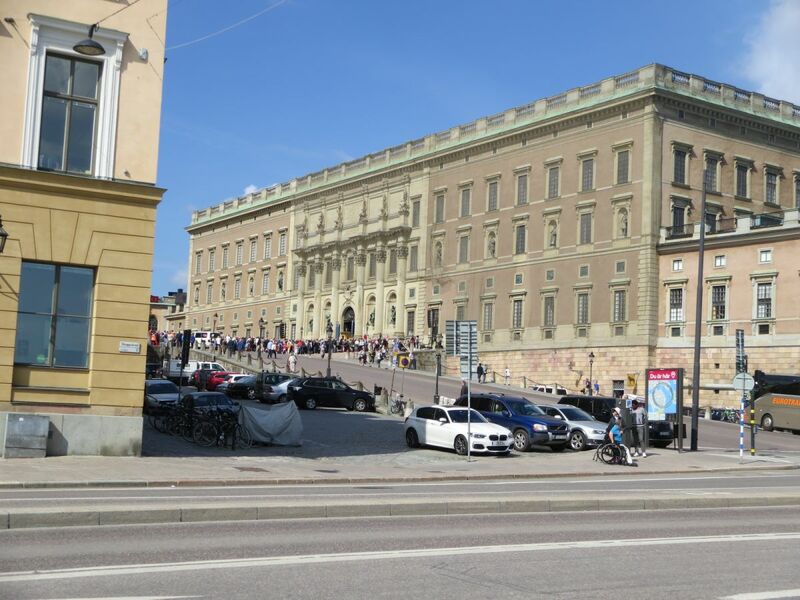 However, if you are trying to fit a lot into a short amount of time in Stockholm and don’t have time for everything, I think this is one attraction that you can skip if you aren’t really interested in Royal family history. 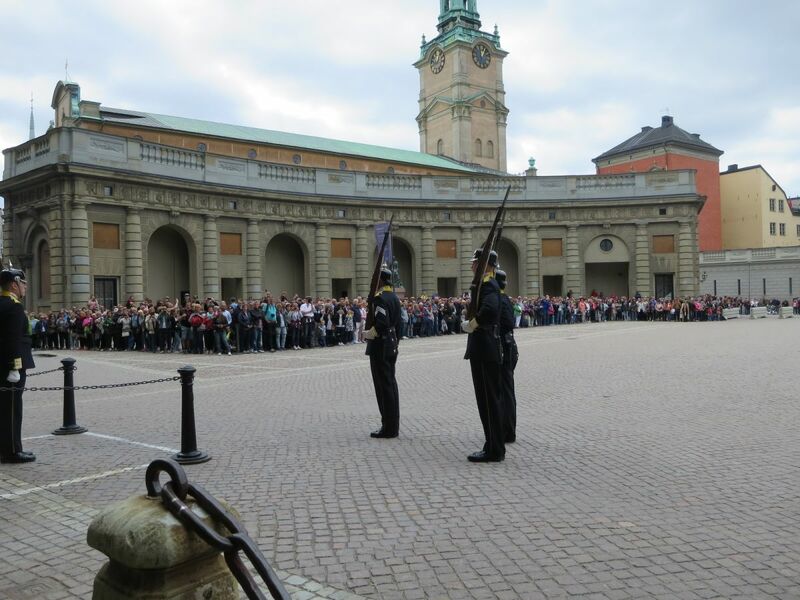 When we had enough of the Royal Palace, we found an exit and ended up walking out into a front row view of the changing of the guards, which a large crowd of people had obviously been waiting a while to see. I’ve seen a few changing of guards in my day, and it’s not THAT exciting. It’s cool to see if you happen upon it, but it’s not something I would wait around for in a crowd. 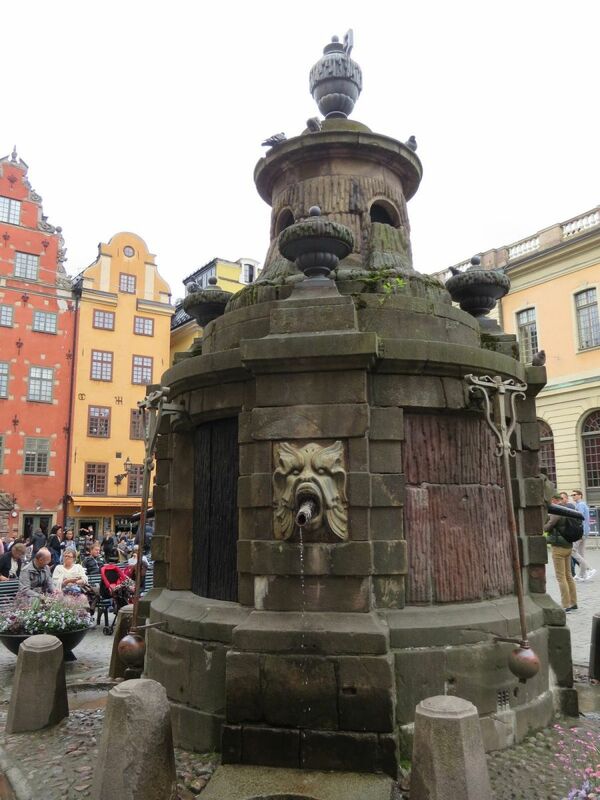 We wandered around Gamla Stan a little more, stopping by the infamous Stortorget (big square) in the middle of Gamla Stan. It is the oldest town square in the city, and host to colorful and picturesque buildings. I read that in December Stortorget is host to a big Christmas market, which sounds like it would be fun to see if you are visiting at that time. By this time it was late afternoon and our feet were getting a bit tired, so we walked back to our apartment in Södermalm for a rest. 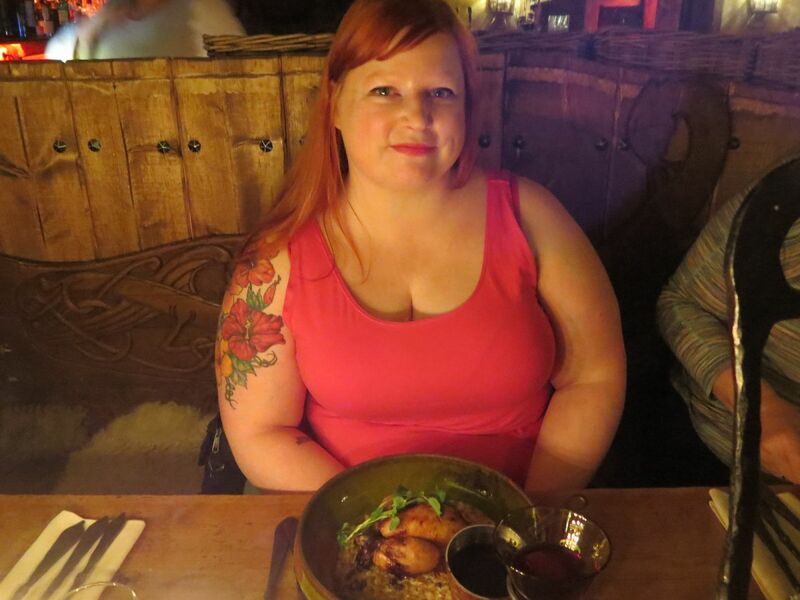 That evening we had a dinner reservation at Aifur Krog and Bar Viking Restaurant in Gamla Stan. Aifur Krog and Bar ended up being one of the highlights of our trip. Aifur was a surprising example of touristy done right. **Tip–definitely make a reservation here, it’s a popular place. 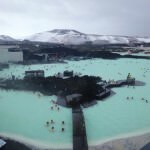 I easily made a reservation through their website a week prior to our trip. Aifur is set up to look like the inside of an old medieval viking tavern or ship. 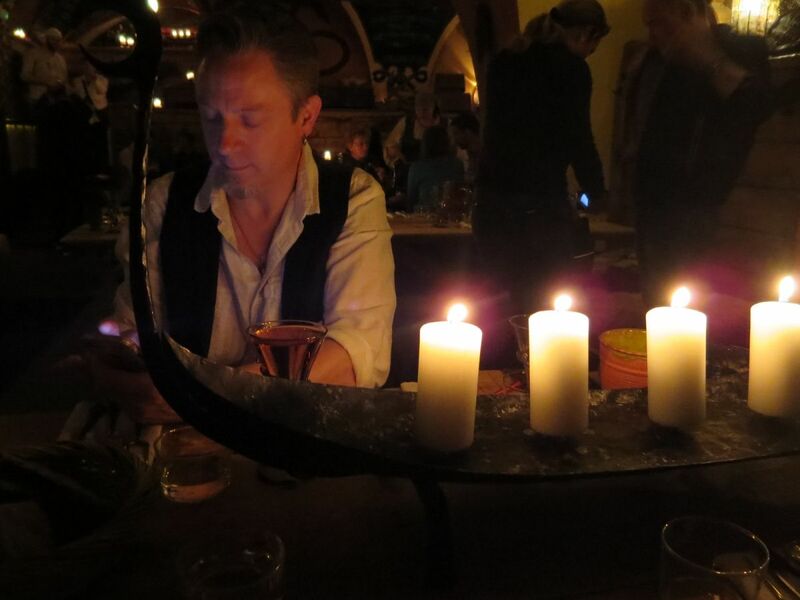 The tables are communal and the light is from candles. 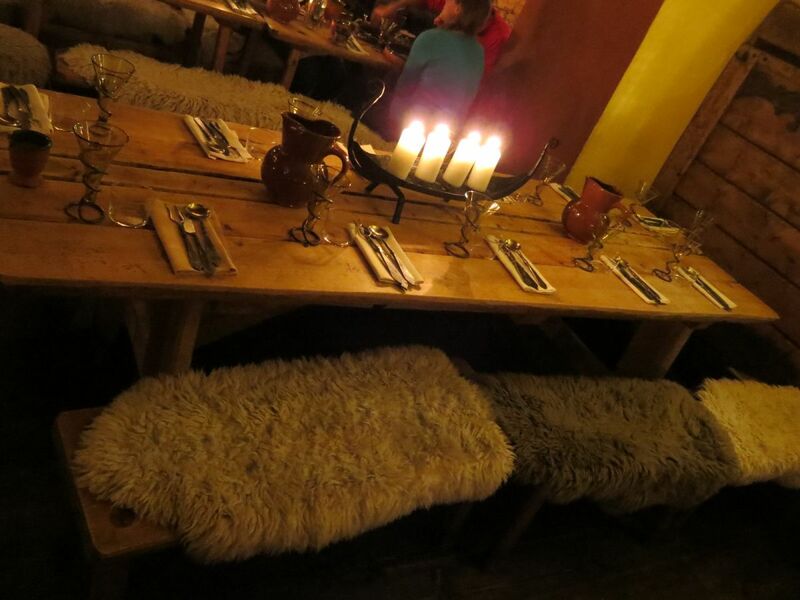 Sheep skins are draped across the benches at the tables and the silverware is modeled after old viking utensils. The staff dress in old viking attire and appeared to enjoy their jobs. The attention to detail throughout the restaurant was very impressive. When you arrive, the host asks your names and where you are from, and then blows on a sheep horn and loudly announces you to the entire restaurant. Everyone claps. We were seated next to a couple who didn’t seem to want to be social, but they left shortly after we arrived. Our next dining companions were a woman from California and her Mom (announced to the restaurant by our host as “Lydia and her Mom”). 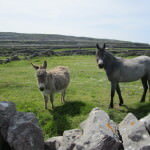 They were much friendlier. We ordered mead, as it seemed like the right thing to do. The mead menu was extensive. I had a berry mead and Paddy had a spicy chili mead. The waitress let us sample the meads before we committed to a full glass, which was nice. The chili mead was really good. Not sure if they had chili peppers back in the viking days, but it was damn good. 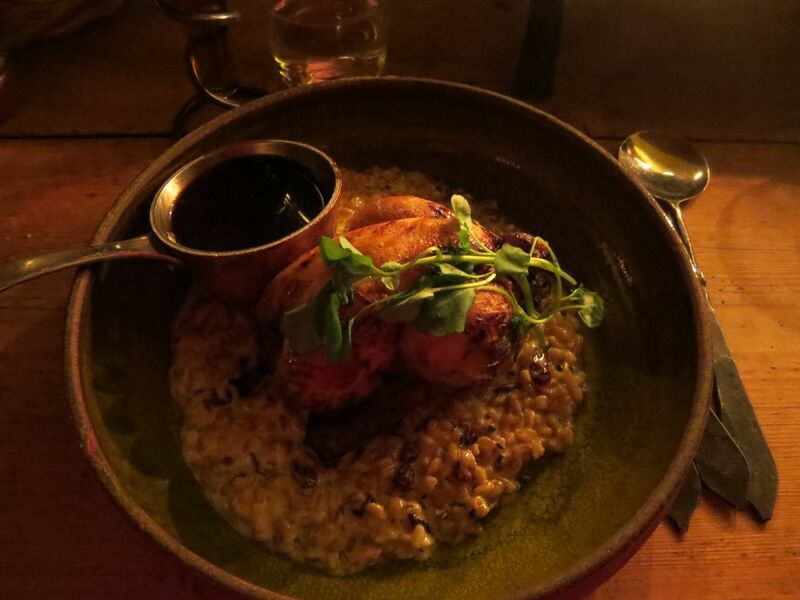 Aifur’s menu was full of historical detail about each dish. I went with Varangian’s Roasted Dwarf Chicken, and Paddy had the Indulgence of the Raven Lord. 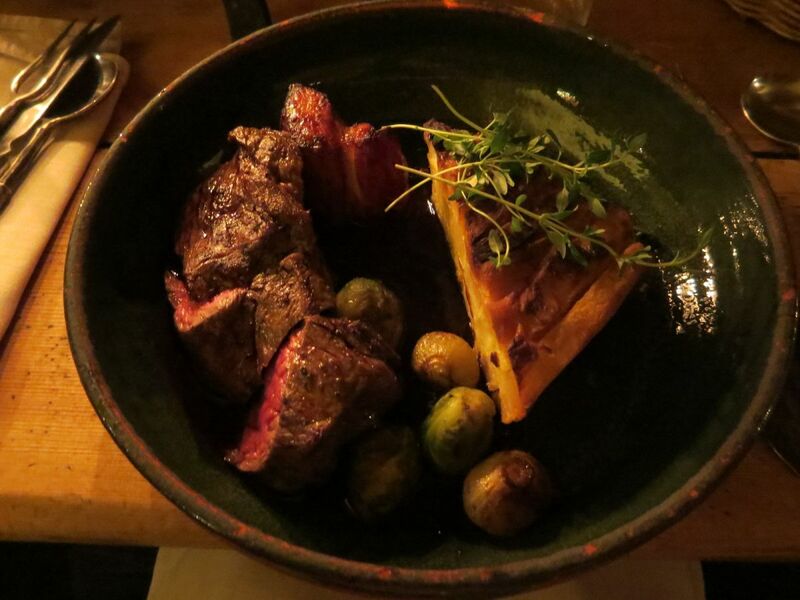 Paddy chose his mostly on title alone, because he couldn’t not try something called “The Indulgence of the Raven Lord.” The Indulgence was a marinated flap steak, with juniper roasted pork belly, parsnip cake, sprouts, baby onions, and a red wine sauce. The dishes were plenty hearty by themselves, we were glad that we hadn’t ordered appetizers. Towards the end of our meal, the restaurant was looking more and more empty. We wondered for a moment if reservations had been necessary, but were assured that they were when our host blew the sheep horn and announced the arrival of “a bunch of Austrian bankers.” The restaurant was soon filled with Austrian bankers, ready to eat, drink, and make merry. We asked for our bill, as the waitstaff was quickly becoming overwhelmed with the new guests. 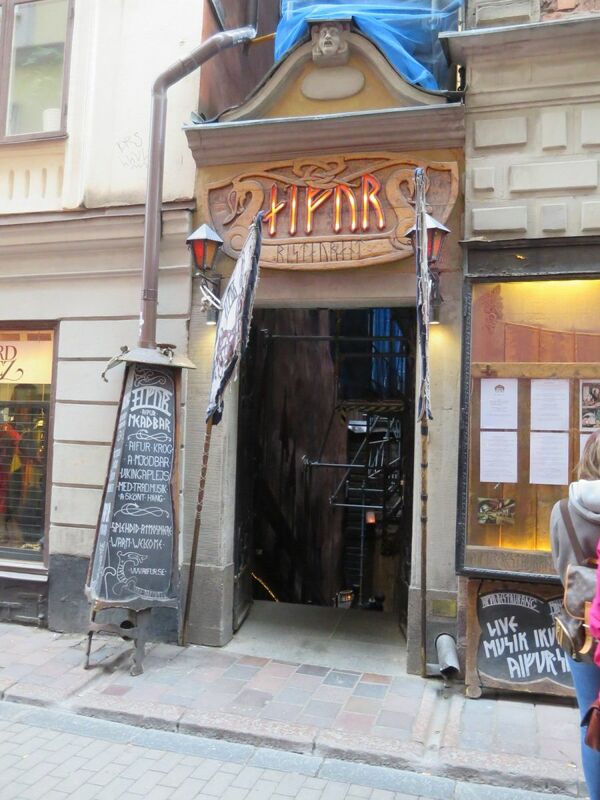 Aifur viking restaurant was a bigger highlight of our trip to Stockholm than we expected it to be. The attention to detail in everything from the decor to the well-researched menu to the attire of the waitstaff was phenomenal. If you’re going to Stockholm, try not to miss this place. Be sure to make an advance online reservation. 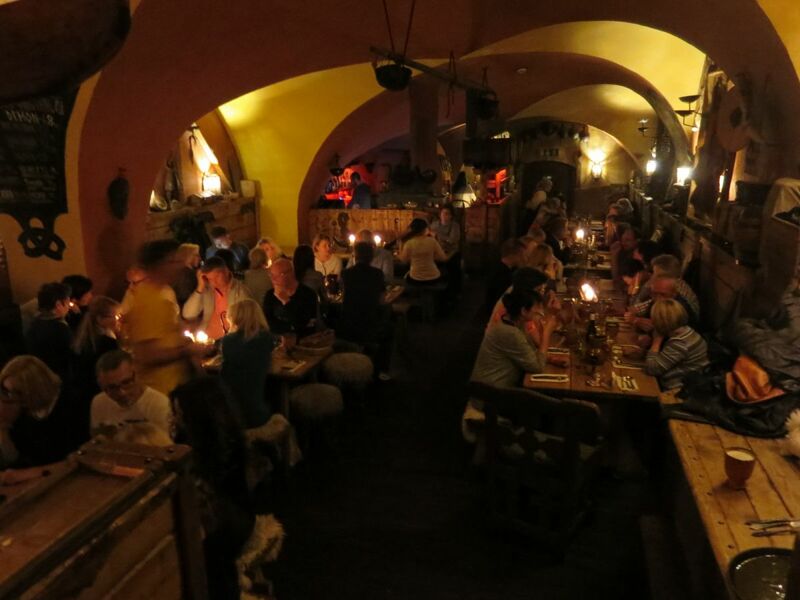 After dinner, we thought maybe we’d continue with the theme and duck into the bar at nearby Sjätte Tunnen medieval restaurant for a drink. Sjätte Tunnen was a little campier than Aifur, but still looked like it might be fun. I ordered their rose hip mead special, which was good but a very tiny pour, not sure it was $8.00 USD worth. The bar portion of the restaurant was rather empty and isolated, good for a date or intimate conversation if that’s what you are looking for. We would have loved to have some more drinks and explore more bars in the Gamla Stan area, but it was just too expensive. We brought box wine for this reason, so we went back to our apartment to relax. **Money-saving tip: If you do bring your own booze but don’t want to drink in your room/apartment, bring a water bottle or thermos and take it to the park. It is not illegal to drink in parks in Sweden. Even cheaper–get some food at the grocery store and have a picnic for dinner. 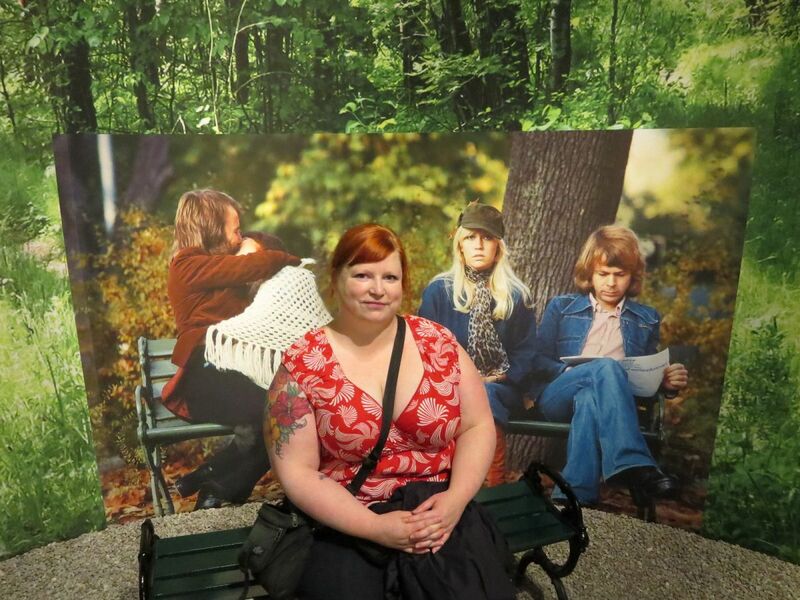 Our second full day in Stockholm was my birthday, and the thing I wanted to do most was go to the ABBA Museum. I’m not a huge fan of ABBA, but I am all about unusual museums. I am also not at all opposed to getting on the dance floor when “Dancing Queen” comes on at a wedding reception. ABBA did write some catchy tunes. 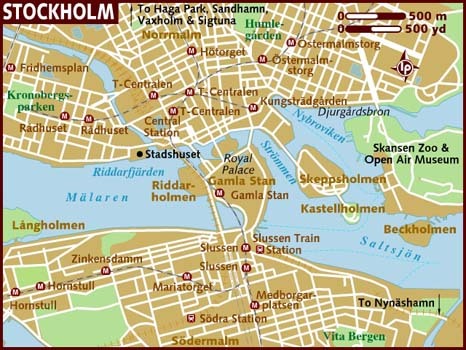 Just about all the museums in Stockholm are conveniently located in one island location in the city called Djurgården. 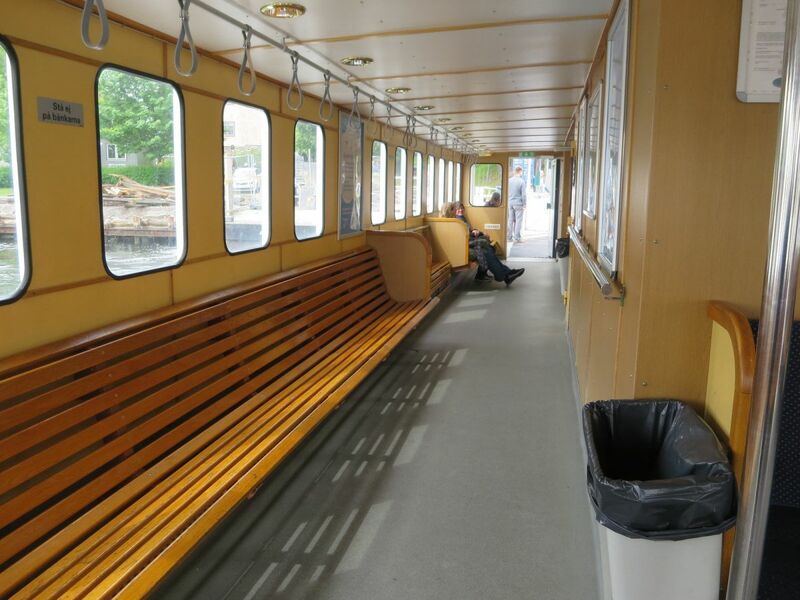 You can easily get to Djurgården by passenger ferry from the Slussen/Gamla Stan ferry terminal, tickets are just like the T-bana and are $5.00 USD per person each way. You may purchase tickets at the ticket window at the ferry terminal. I had read that the ABBA Museum get’s pretty busy, and they only allow a certain amount of visitors into the museum at a time to make the experience enjoyable and not over-crowded. You can also buy your tickets in advance online for a slight discount. We didn’t want to have a set schedule, so we just got up early and arrived shortly after the museum opened. 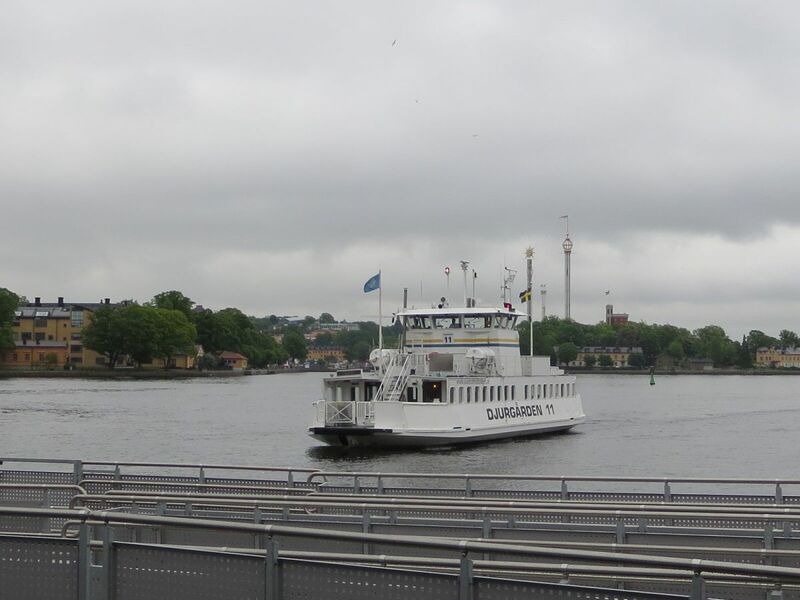 The ABBA Museum was a short walk from the Djurgården ferry. 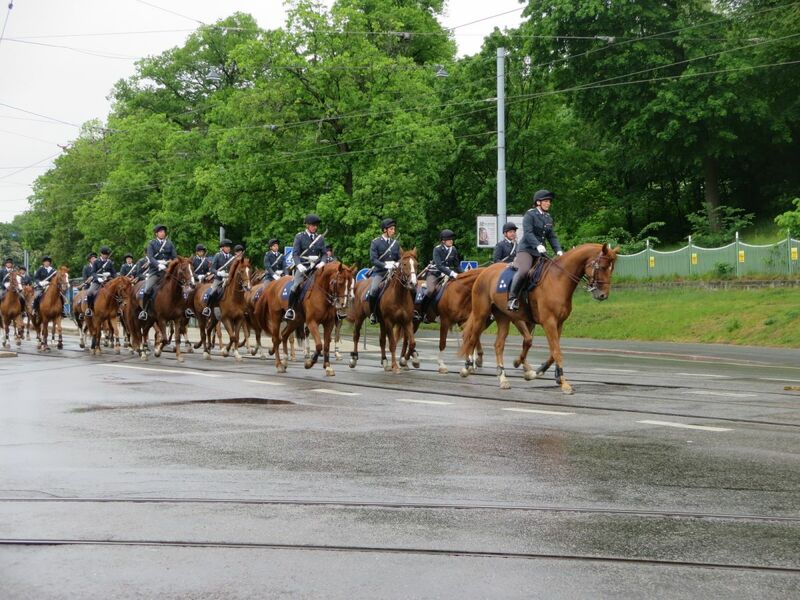 On the way to the museum, we witnessed a procession of policemen on horses. Not sure what this was about. 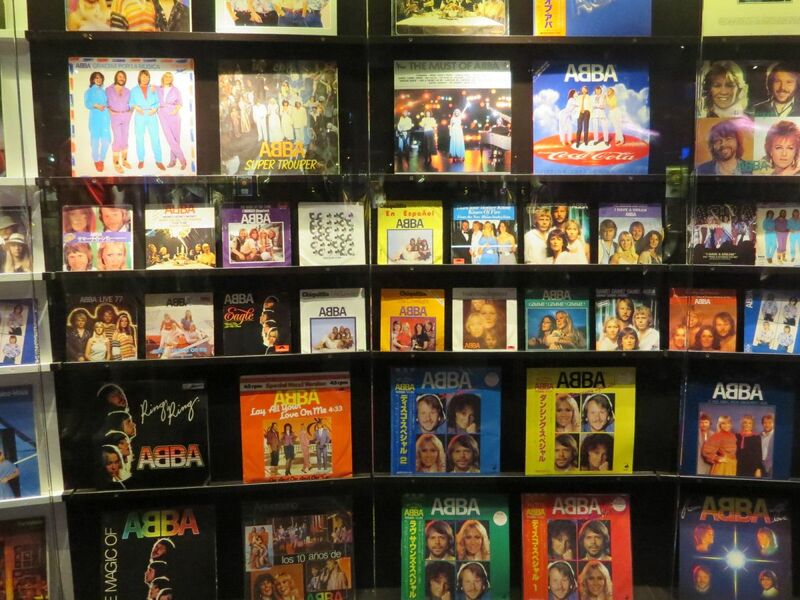 When we arrived, the ABBA Museum was pretty empty, and no one was in line. Tickets were a bit more than I expected at $30 USD per adult, but se la vie. 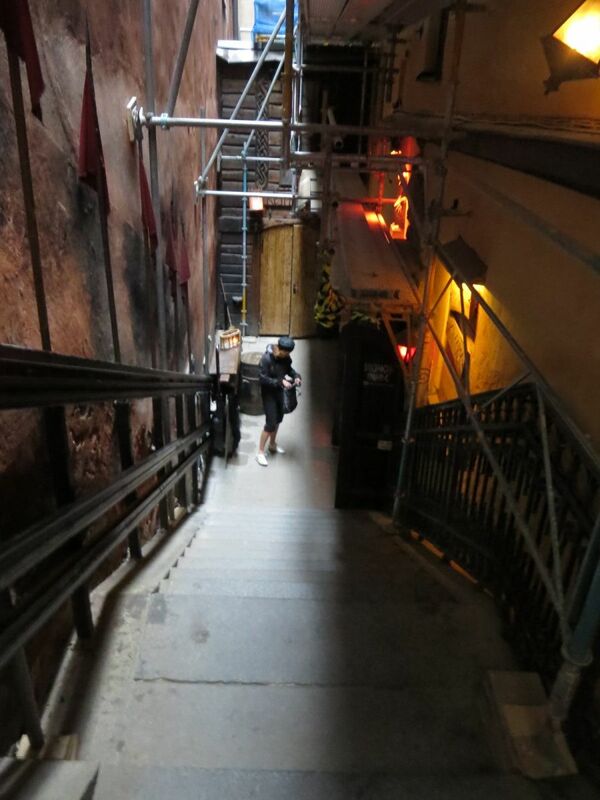 We walked down a spiral staircase into a brightly colored disco-tastic experience, but this was only the pre-ABBA museum area. 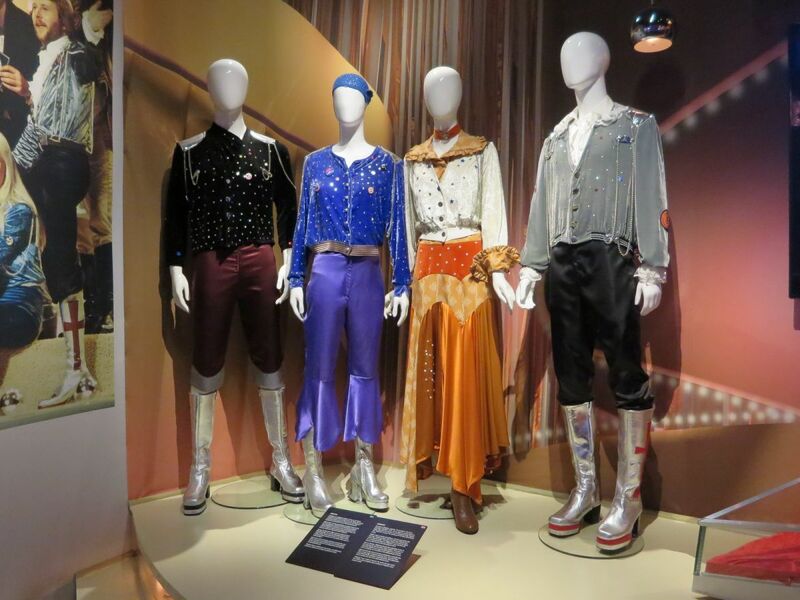 The museum combines the main ABBA attraction with a Swedish music and pop exhibit, which you can view before and at the end of the ABBA experience. 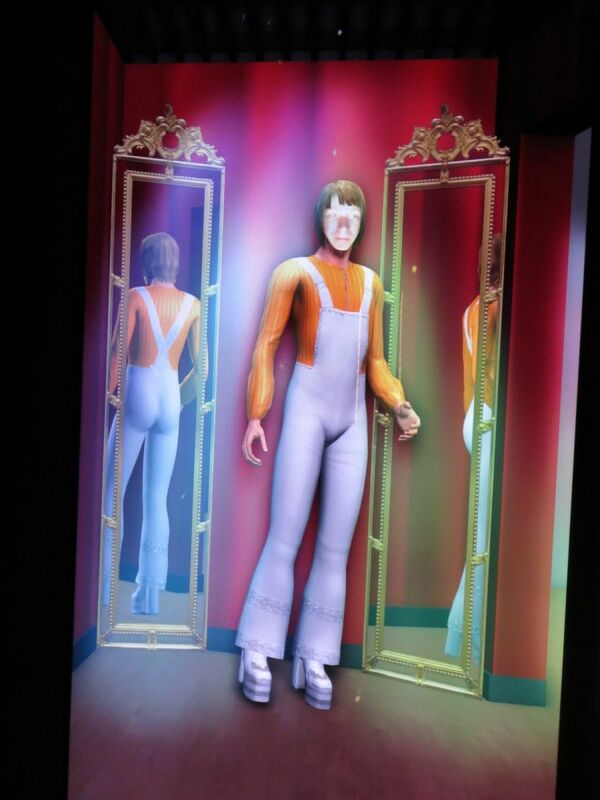 We left the rainbow disco room through a black curtained door, and were immediately assaulted by a larger-than-life movie screen montage of ABBA music and performances. 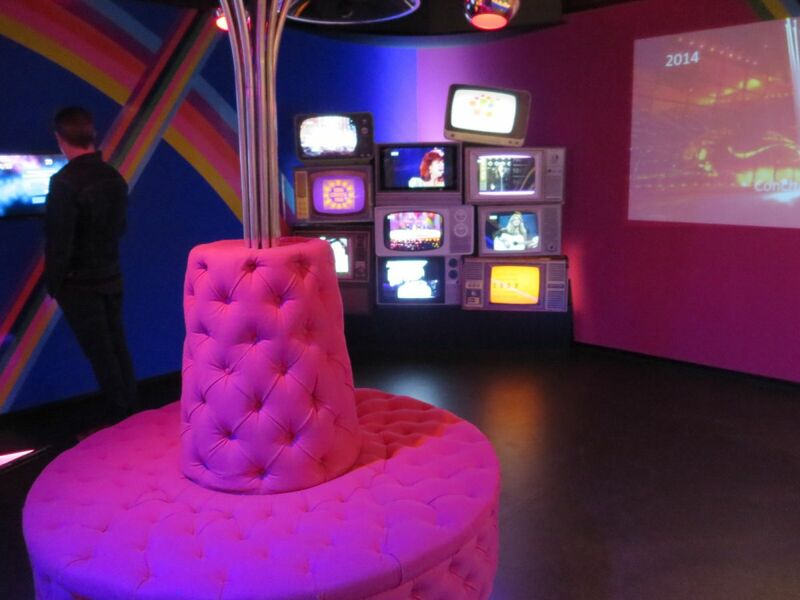 After that, we entered the main portion of the ABBA museum. 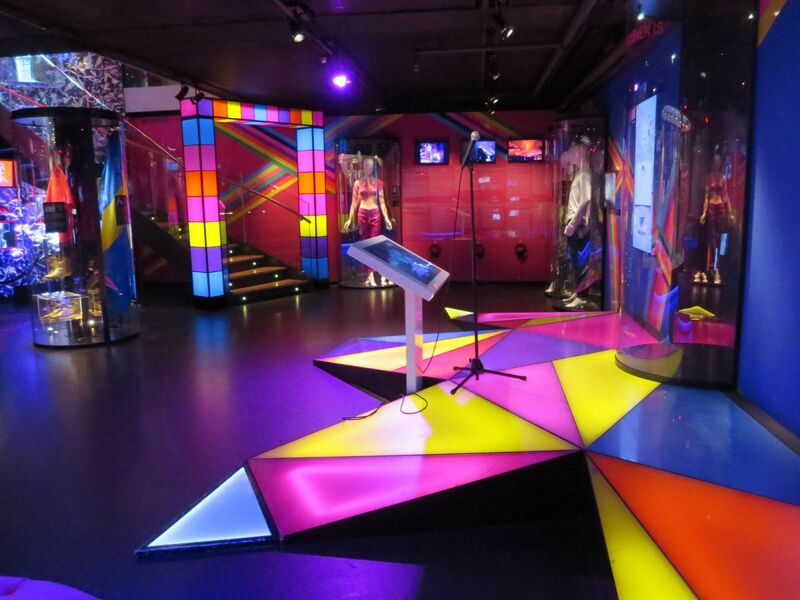 There were very detailed exhibits on each performer’s history and background, what their recording studio and dressing rooms would have looked like, and all of their glorious (or horrendous?) costumes. 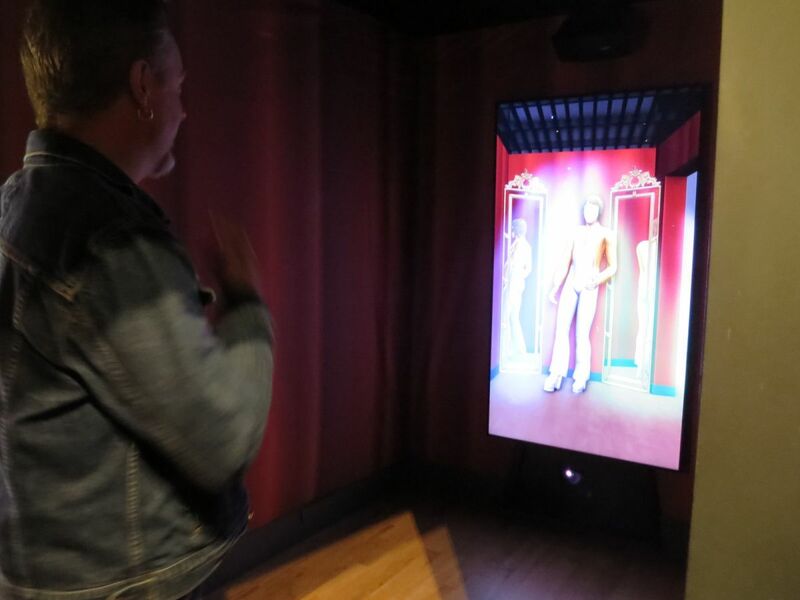 There were interactive exhibits as well where you could sing (and record and purchase) your karaoke ABBA track, or have a photo of your face imposed on each ABBA member’s face and dance around, your moves reflected back on a video screen (this part was a bit creepy). 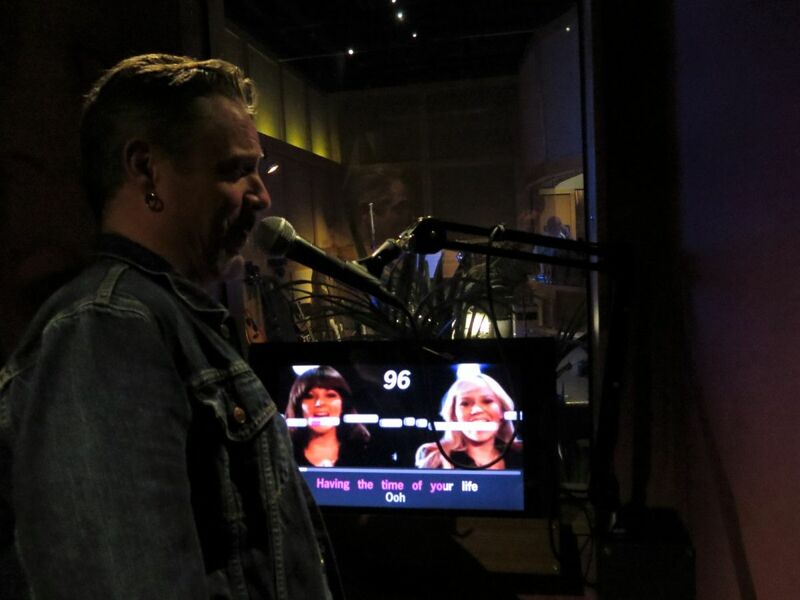 You could also go onstage and karaoke your favorite ABBA song with projections of ABBA dancing and performing on a stage along side you. 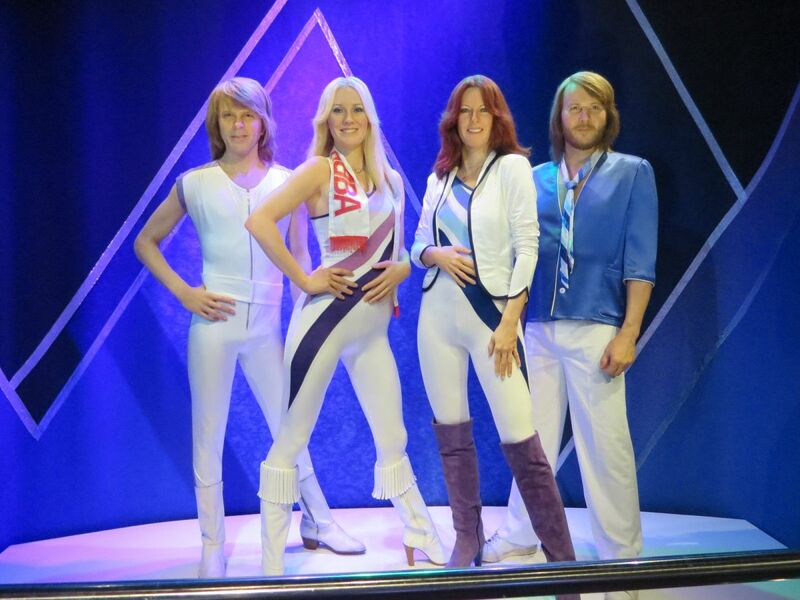 If you are someone who is really into ABBA, you will probably have a great time. 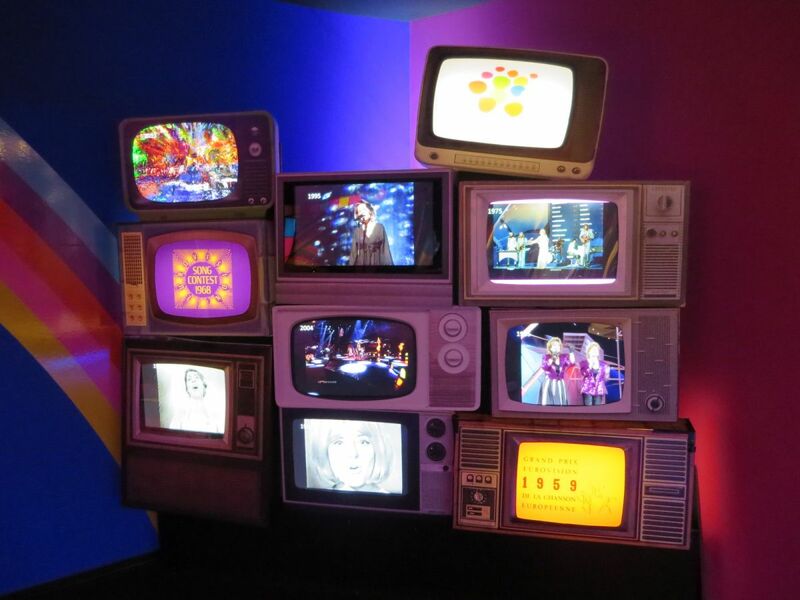 The museum ended with more of the Swedish music exhibit, complete with videos of famous bands from the US, UK, and other countries performing at the amusement park next to the ABBA Museum (Tivoli Grönalund). There are all sorts of fun, over-priced things to tempt you in the gift shop on your way out, we left with a Christmas ornament, magnet, and some ABBA Museum chapstick. 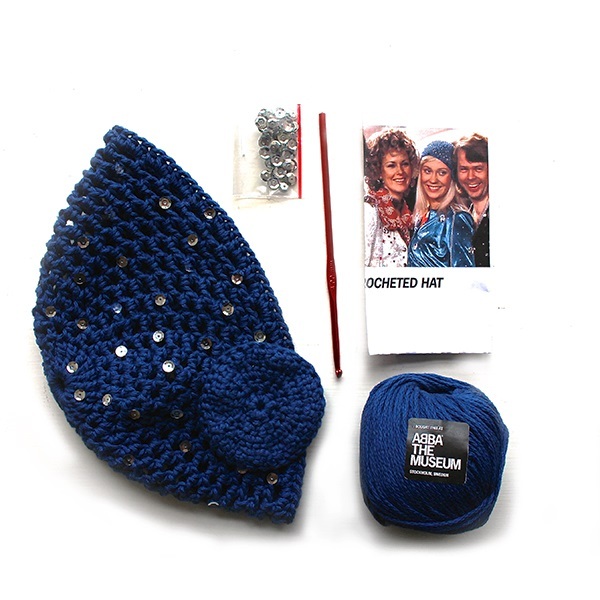 We passed on the $25 coffee mugs and the “knit-your-own Agnetha hat” kit. When we left, there was a line at the ABBA Museum that we were glad we avoided by getting there early. 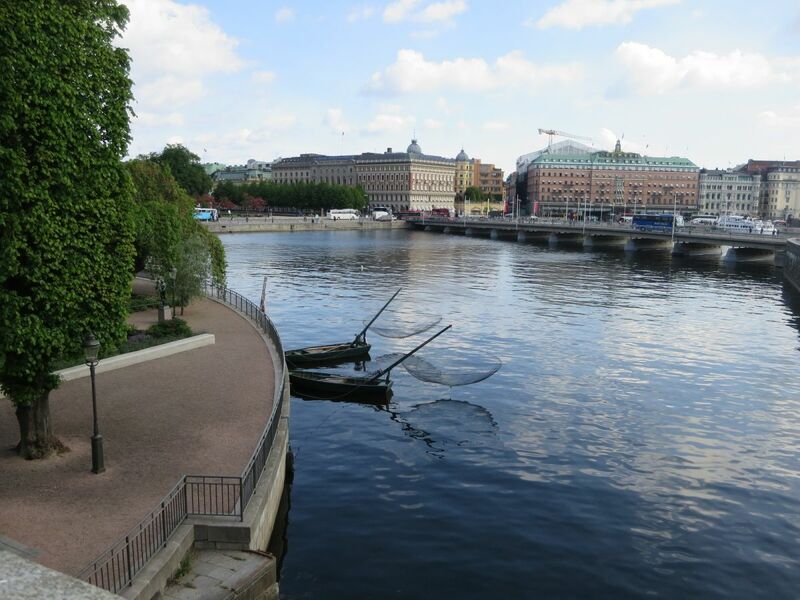 There are a number of museums in Djurgården, all within walking distance from each other. 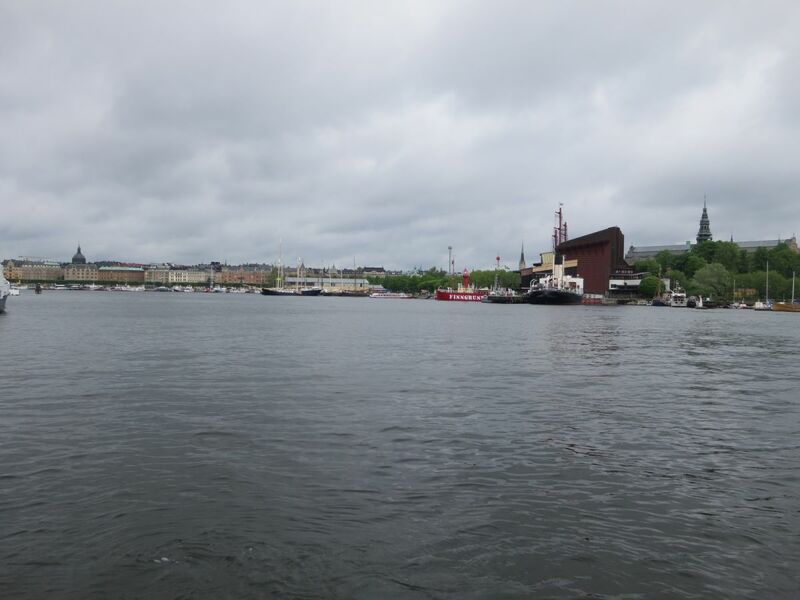 There is only so much museum we can handle in one day, so we thought we’d check out the most popular of all the museums, the Vasa Museum and then call it good for the day. The Vasa Museum is an exhibit of the infamous Vasa ship that sank in Stockholm Harbor in 1628, and was dredged up and made into a museum 333 years later. To our disappointment, we didn’t get to the Vasa Museum early enough. The tour buses had all arrived, and the line to get into the museum was almost a half mile long. We decided it wasn’t worth it. In retrospect, it might have been a better idea to visit the Vasa Museum first right when it opened, and then the ABBA Museum afterward as the Vasa Museum was clearly the most popular attraction. 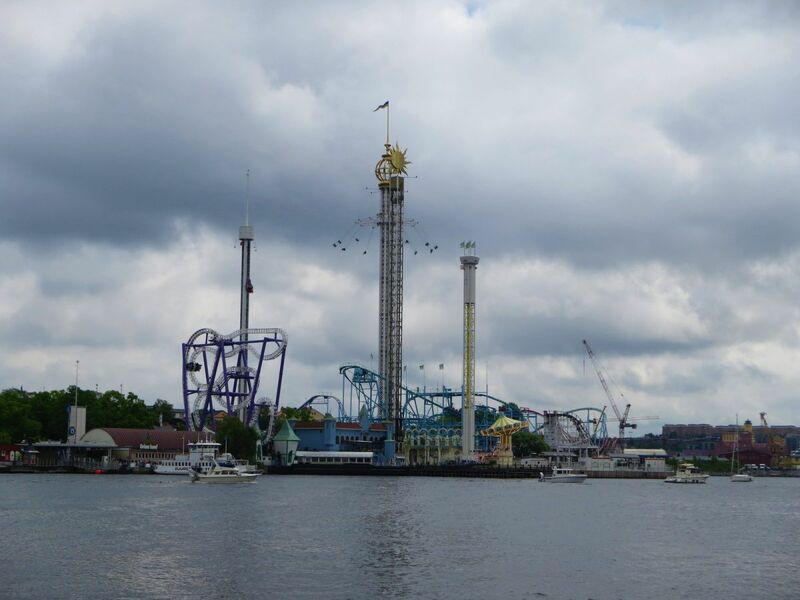 If you are interested in other museums, there is also the Nordiska Museum (Nordic Museum of Swedish Culture and History), an aquarium, The Spirit Museum (a museum of booze), The Biological Museum (museum of Swedish plants and animals) and the Tivoli Grönalund amusement park. 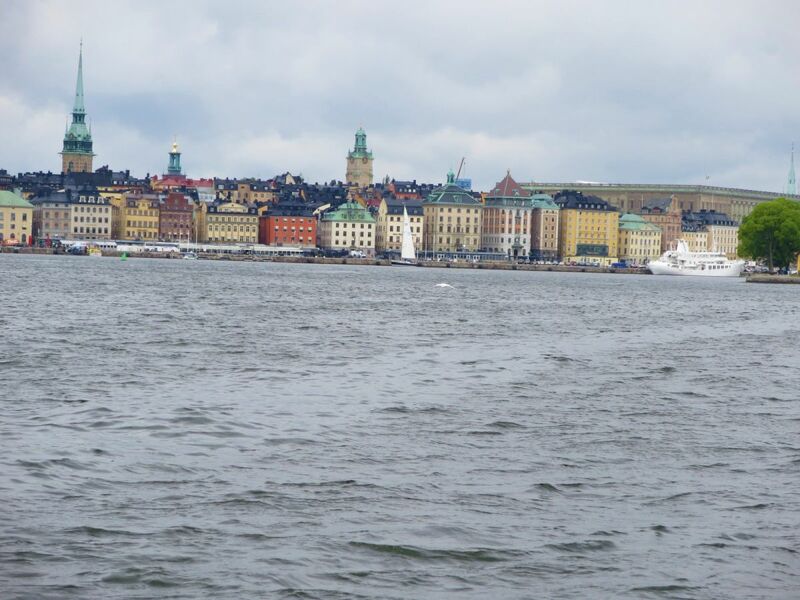 We made our way back to the ferry, fighting through the massive ticket crowds outside the Tivoli amusement park, and enjoyed a nearly-empty boat ride back to Gamla Stan while incoming ferries arrived overflowing with tourists. We were happy to escape. 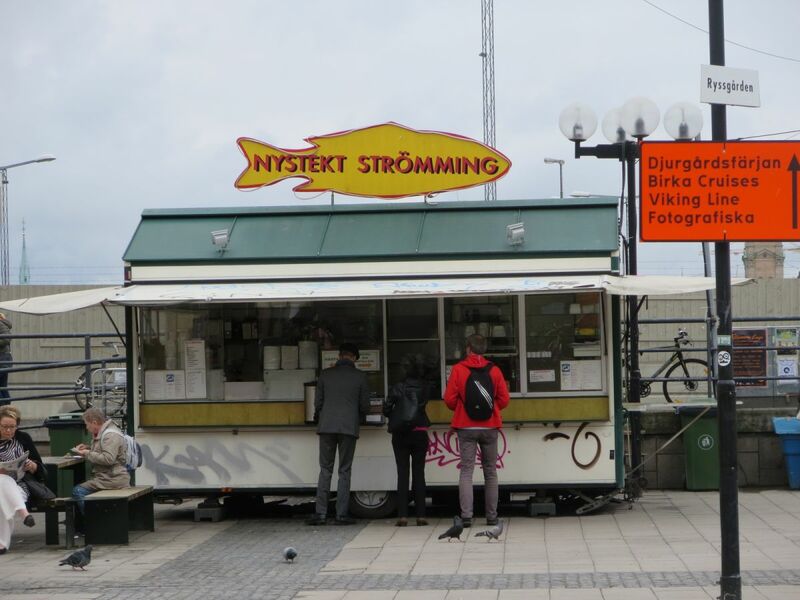 We were pretty hungry when we arrived back, so we stopped at the nearby fried-herring food truck called Nystekt Strömming just a short walk from the ferry towards Södermalm in Slussen. 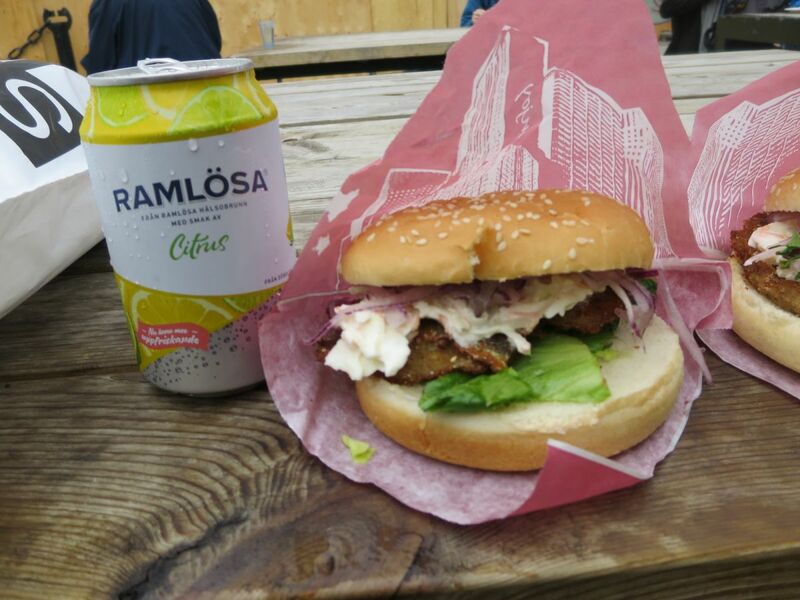 For a very reasonable price, we enjoyed delicious fried herring burgers and sparkling waters. Also offered were fried or grilled herring plate lunches with mashed potatoes and pickles. 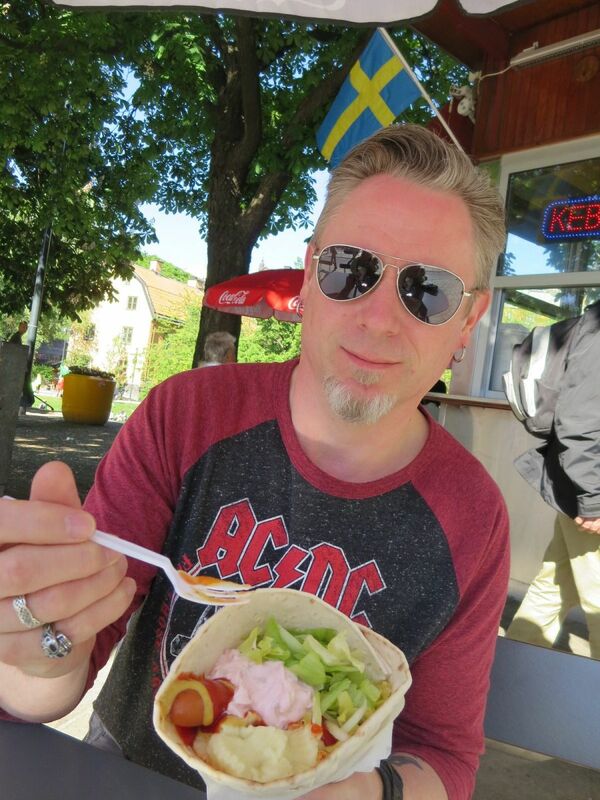 This was probably the most affordable authentic Swedish food we encountered on our trip. We spent the rest of the afternoon exploring some of the shops on Götgatan Street in Södermalm. My favorite was a shop called Flying Tiger that had a bunch of really random (but fun) inexpensive stuff. For dinner that evening, we decided to splurge as it was my birthday and all. 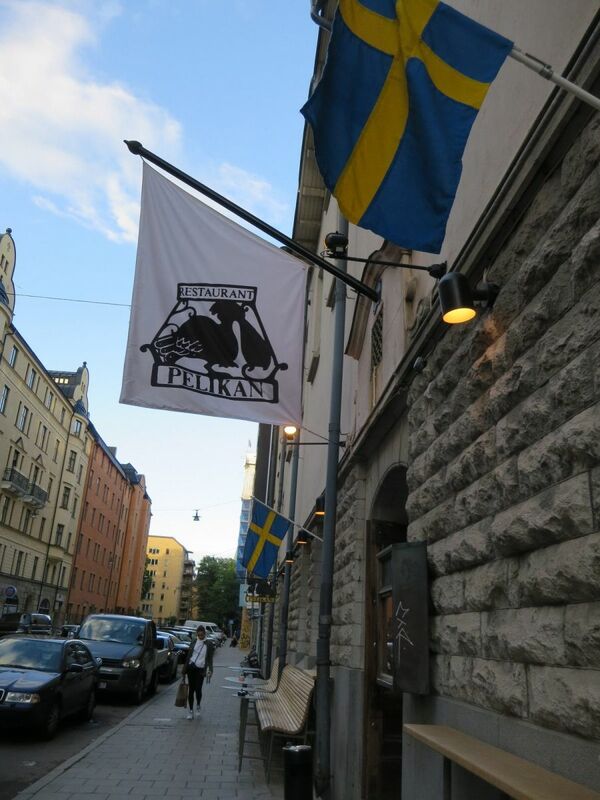 We had made a reservation at Pelikan, an upscale traditional Swedish restaurant in Södermalm that was featured on Anthony Bourdain’s show No Reservations. 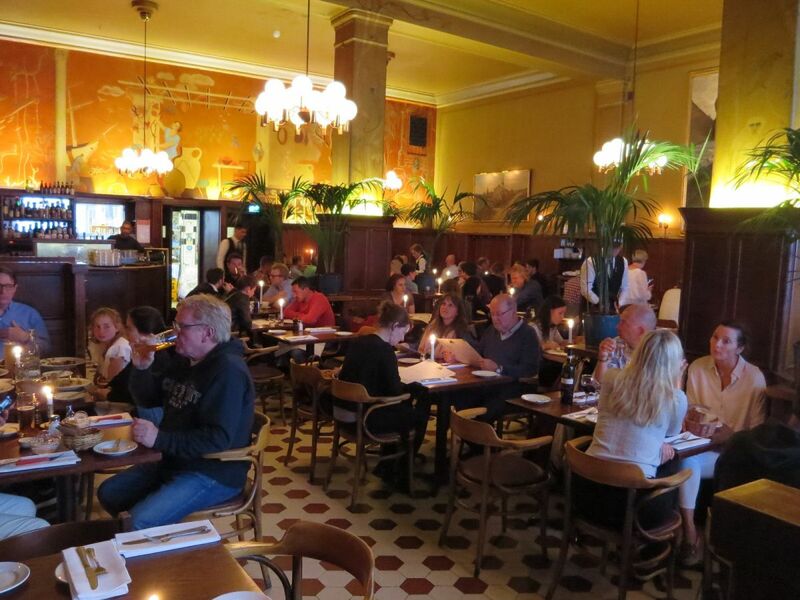 Pelikan has been a restaurant in Stockholm since 1664, has moved twice and has been in it’s current location since 1931. The service was excellent, as was the food. 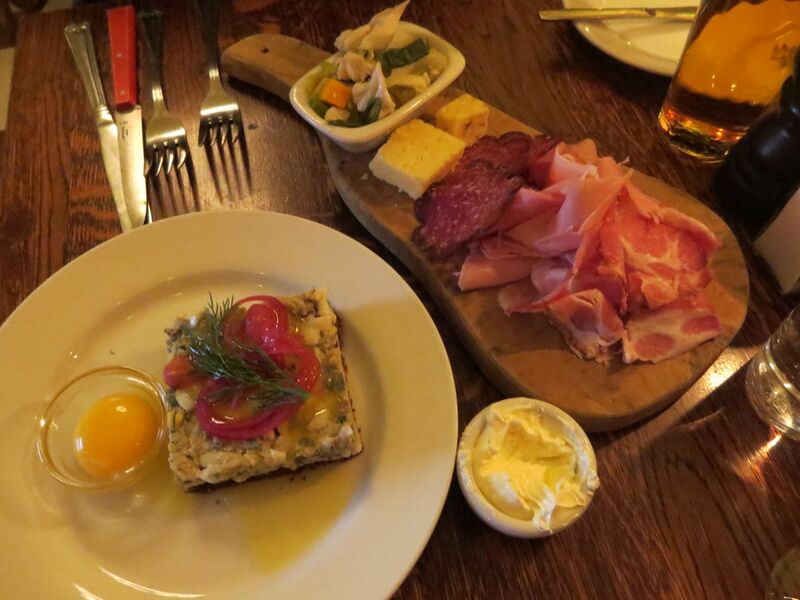 We started with the charcuterie plate and the Gubbröra, a sort of salad with eggs, fresh anchovies, parsley and dill served on sweet brown bread with an egg yolk to put on top. The charcuterie plate included prosciutto, reindeer salami, pickles, and two types of Swedish cheeses. The reindeer salami was our favorite thing on the charcuterie plate, hands down. 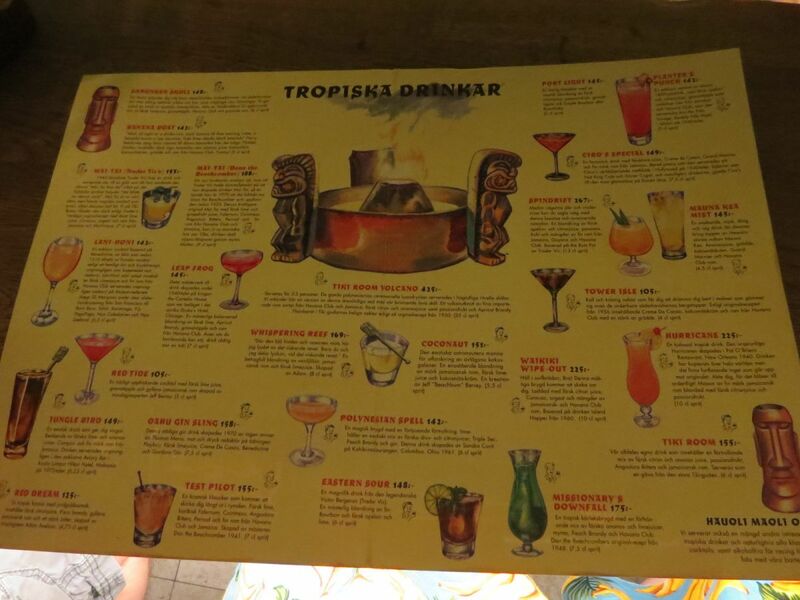 The Swedish aquavit menu was quite extensive. 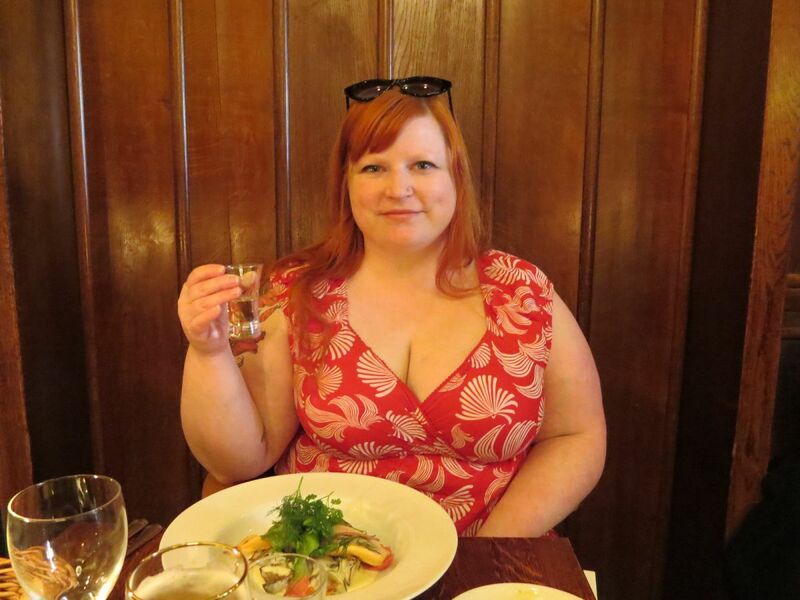 I’ve never tried aquavit before, so I asked the waitress what she would recommend. She brought us two different kinds, mine had “floral” flavors. 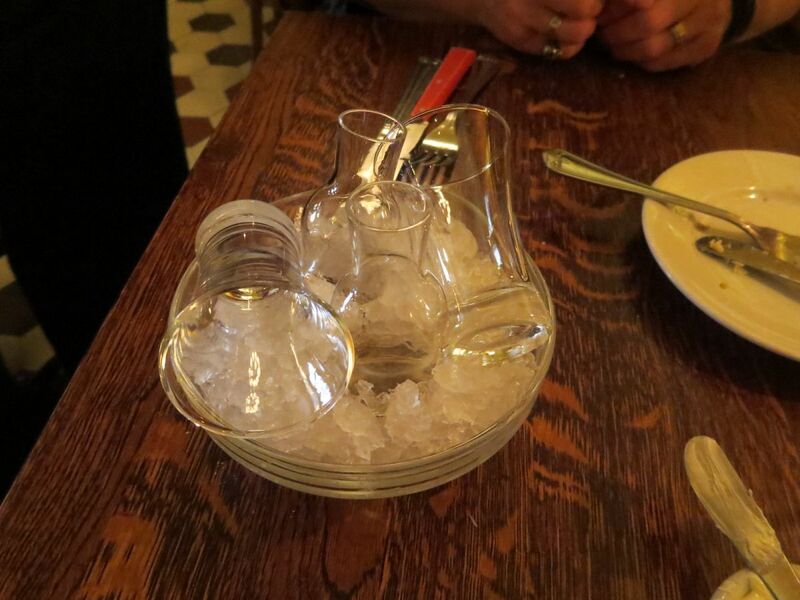 It was served on ice and definitely tasted like flowers. Paddy had only tried an anise-based aquavit before, and he found it refreshing to taste a more herbaceous variety. We had no idea there were so many different kinds. From what I understand, aquavit is essentially a vodka distilled with herbs and other flavors. It is something you sip slowly and is often served at celebratory dinners or gatherings. 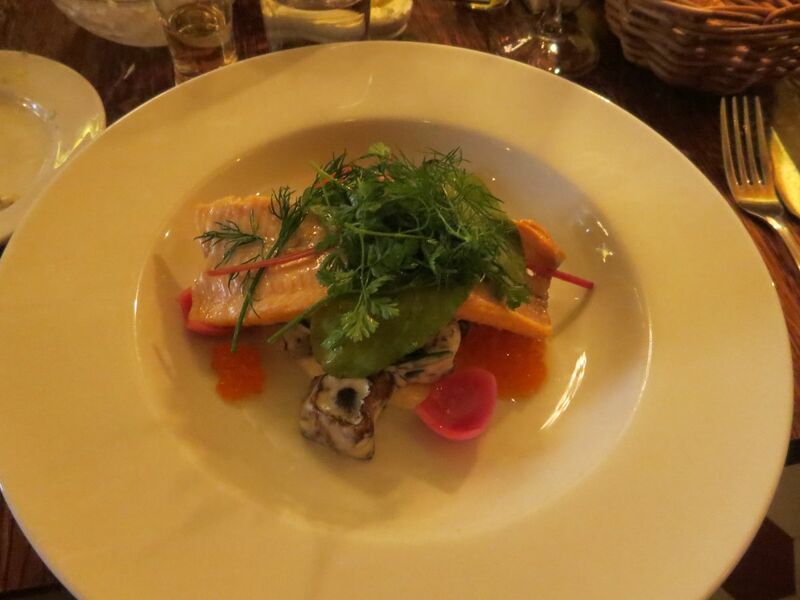 For our entrees Paddy tried the roasted reindeer with root vegetable terrine and lingonberry sauce, and I had the fish special with fresh herbs, bleak roe, and mushrooms with a light sauce (I am not sure exactly what fish it was, but it tasted a bit like trout). It was light and fragrant and delicious. Paddy really enjoyed his reindeer, which he said had a strong, rich flavor. For dessert we shared the chocolate terrine, which was delicious. It wasn’t super sweet–almost kind of like a chocolate cheese. It’s hard to describe but was very good. 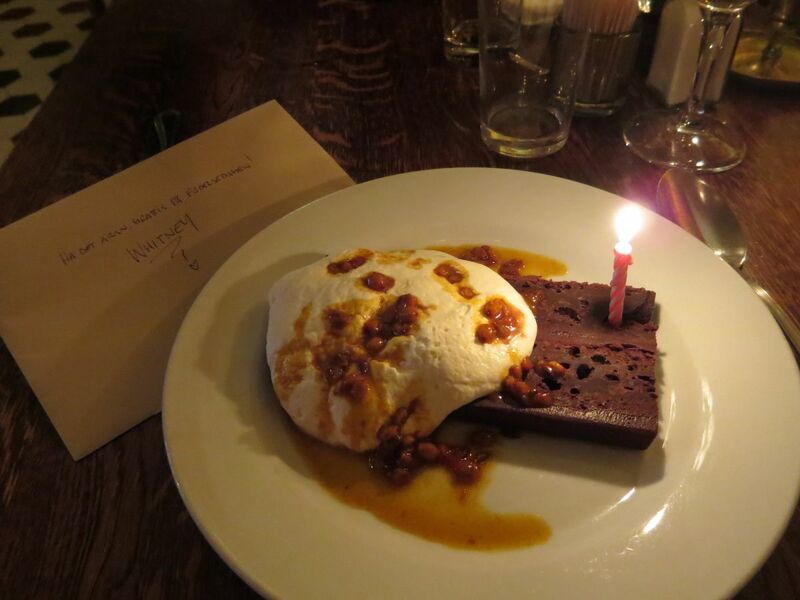 The waitress even added a candle for my birthday. Pelikan was the biggest meal splurge on our trip to Stockholm and Denmark, and it didn’t disappoint. 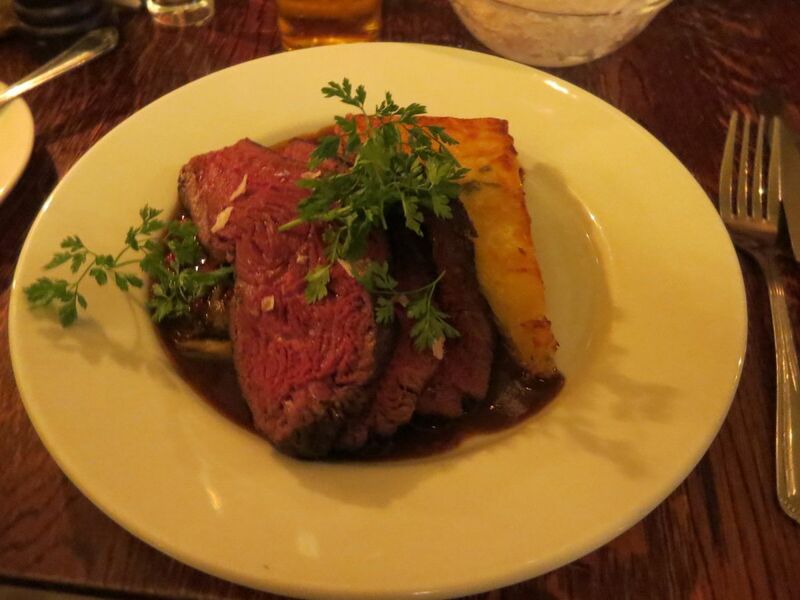 If you are looking for upscale traditional Swedish cuisine in an historic beer hall location, this is your place. Having spent a pretty penny on dinner, we opted not to go out for some drinks afterward, but to relax back at the apartment with our box wine. Our last full day in Stockholm had the best weather. 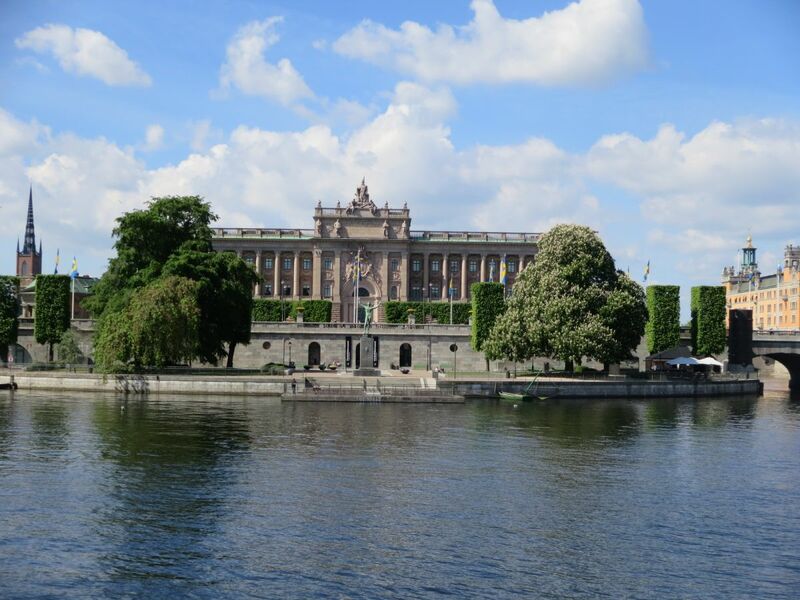 There were a number of things we could have done with our day: day trips to either Drottningholm Palace or the historic viking village of Sigtuna, a ferry ride in the Stockholm archipelago, or another attempt at the Vasa Museum. 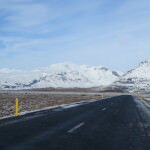 But we didn’t really feel like having a plan, or dealing with buses or ferries or trains. 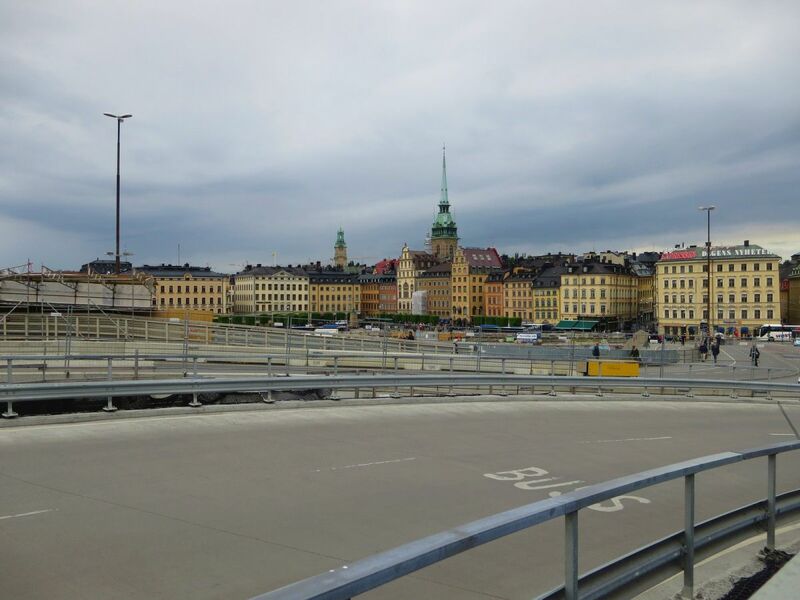 So we opted just to walk around and see a bit more of Gamla Stan and Södermalm. We walked around Stockholm harbor in the sunshine, and then back through Gamla Stan for a little bit of final souvenir shopping. Rikdagshuset, Stockholm. Swedish parliament house. 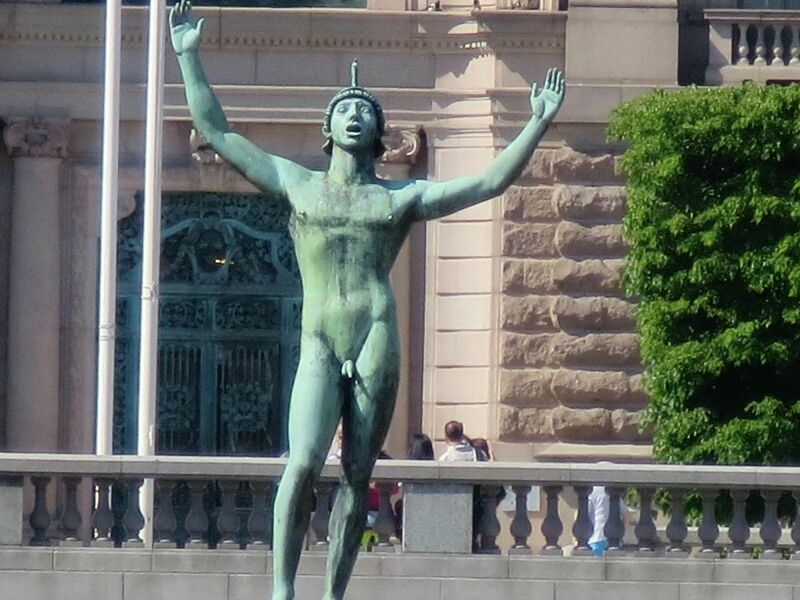 Naked statue in front of Rikdagshuset, Stockholm. Swedish parliament house. 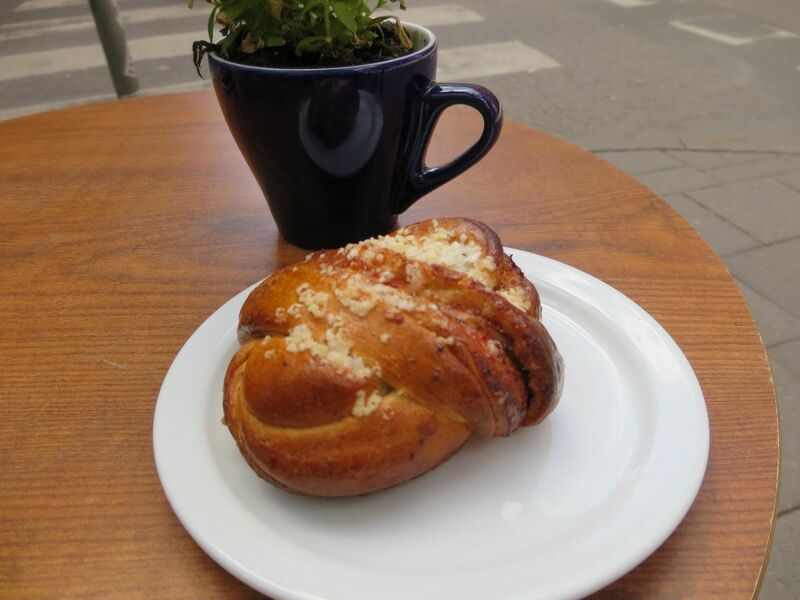 After much walking in the sun, we decided to take a “fika” (Swedish coffee break) at Wayne’s Coffee in Södermalm. Paddy had a coffee and I had a mojito lemonade (lemonade with mint leaves) and a kanelbullar, which is pretty much the national pastry of Sweden. It is essentially a yeast-bread cinnamon bun, but without all the nasty frosting and extra sugar the American cinnamon buns come with. Instead, it is light and airy, and has a sprinkling of pearl sugar on top with a light egg wash glaze. It was a perfect little afternoon snack. 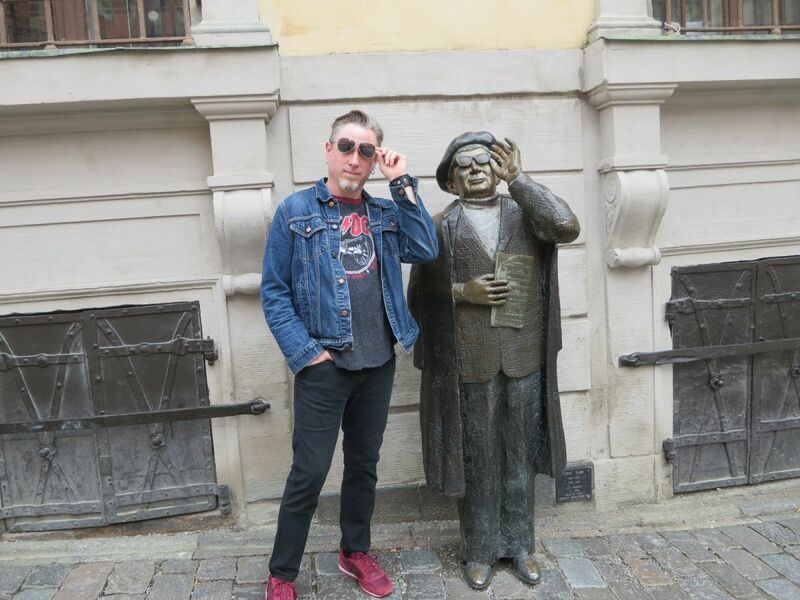 We spent some more time walking around Södermalm. Most of the interesting shops were on Götgatan. For dinner that evening we decided that we couldn’t leave Sweden without trying a tunnbrödsrulle. 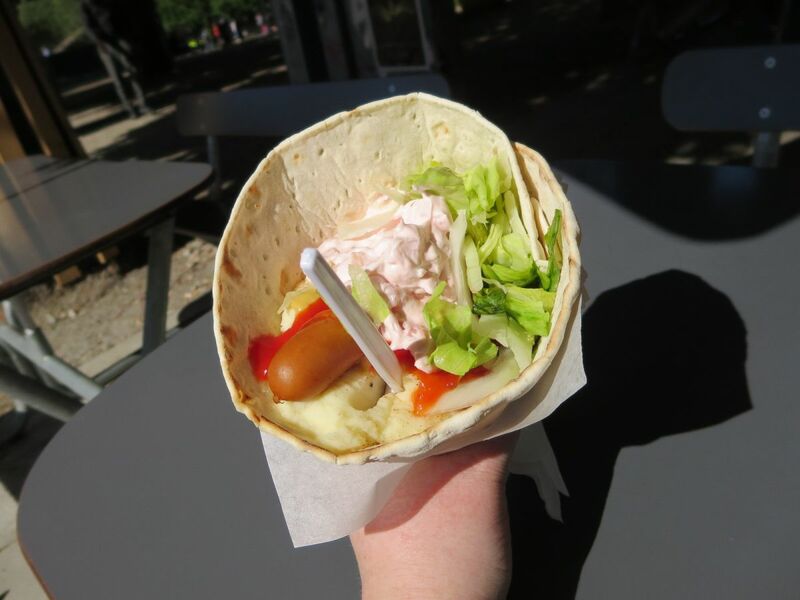 A tunnbrödsrulle (“thin bread roll” in Swedish) is a hot dog rolled up in thin flat bread with mashed potatoes, lettuce, onions, ketchup, mustard, and shrimp salad. It is typically something Swedes get at a kiosk on the way home from the bar in the wee hours of the morning. However, since we did a mega-splurge for dinner the night before, we thought this would be an inexpensive dinner option. 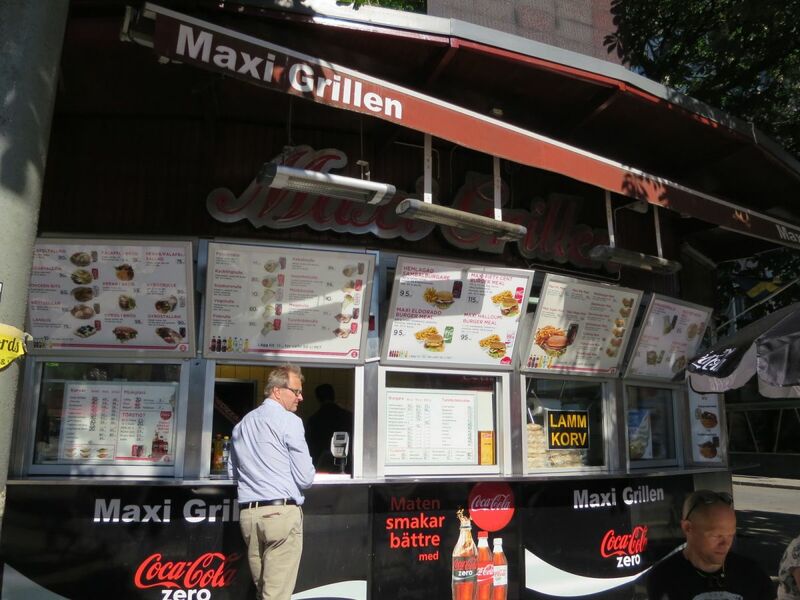 We ordered from the Maxi Grillen on Gotgatan near the Medborgarplatsen. Service was less than friendly, but food was served fast. The tunnbrödsrulle came with a fork. Our verdict: Definitely order sans ketchup. The ketchup was a bit overly sweet. Also, I think it might be better with a higher quality shrimp salad. This just tasted like bay shrimp drowned in mayo and thousand island dressing. I didn’t make it all the way through mine, it was really rich and gave me a bit of a stomach ache. In any event, it was uniquely Swedish and we were glad to have tried it. If you go to Stockholm and want to try a tunnbrödsrulle sober, I would recommend trying chef Magnus Nilsson’s tunnbrödsrulle at Teatern in Södermalm. Otherwise, the junky kiosk dogs might be tasty after many, many beers. 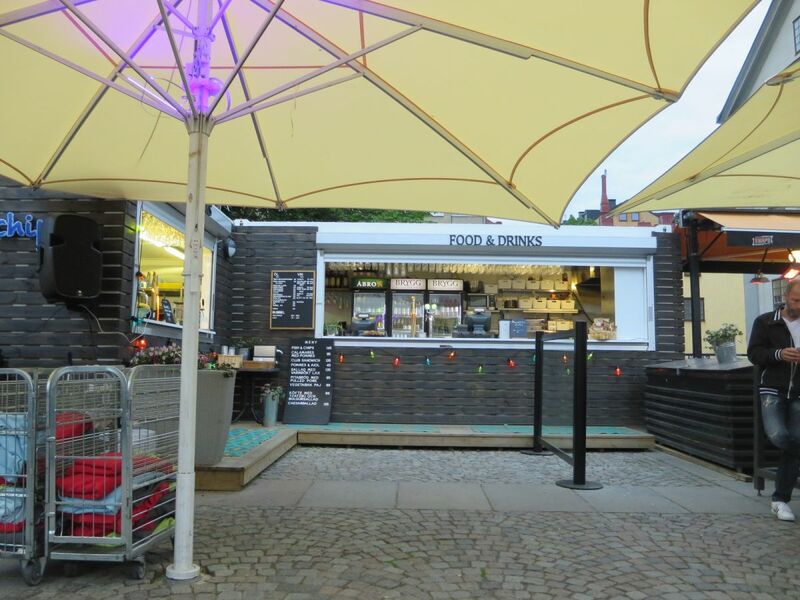 If you do try Magnus Nilsson’s tunnbrödsrulle, please let us know how it was–we wanted to go there but didn’t have time. 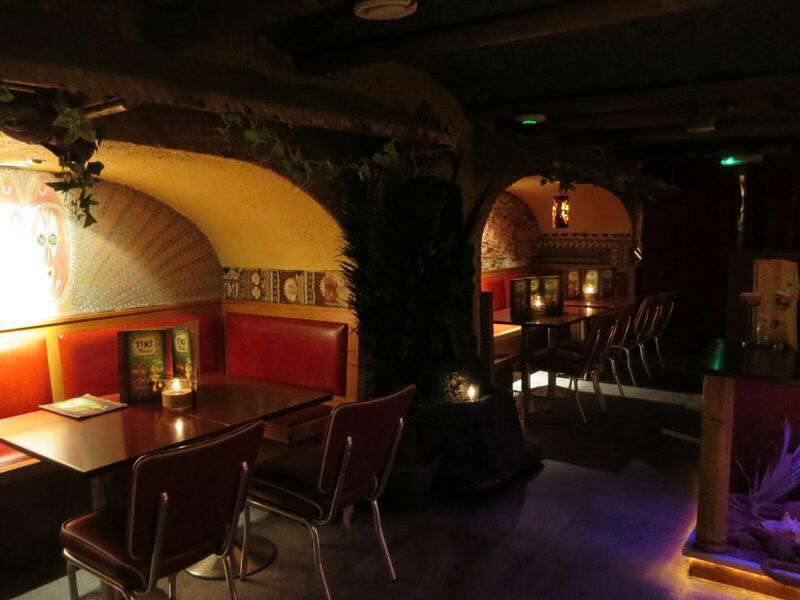 After our tunnbrödsrulle adventure, we got on the T-Bana subway and headed north to the Tiki Room bar in the Vasastan neighborhood. 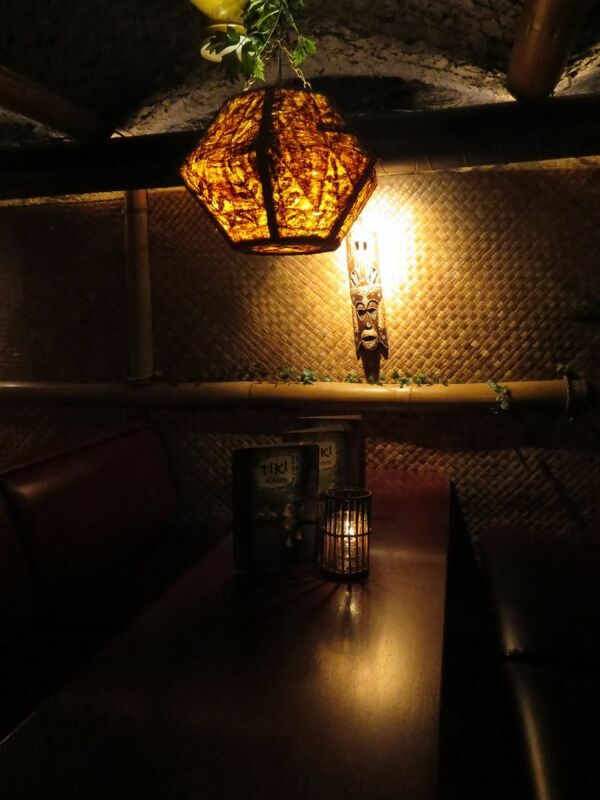 If you’ve read much of our blog, you may have noticed that we have a tiki bar fascination. It was very early in the evening, and most of the bar patrons were upstairs enjoying the outdoor patio. 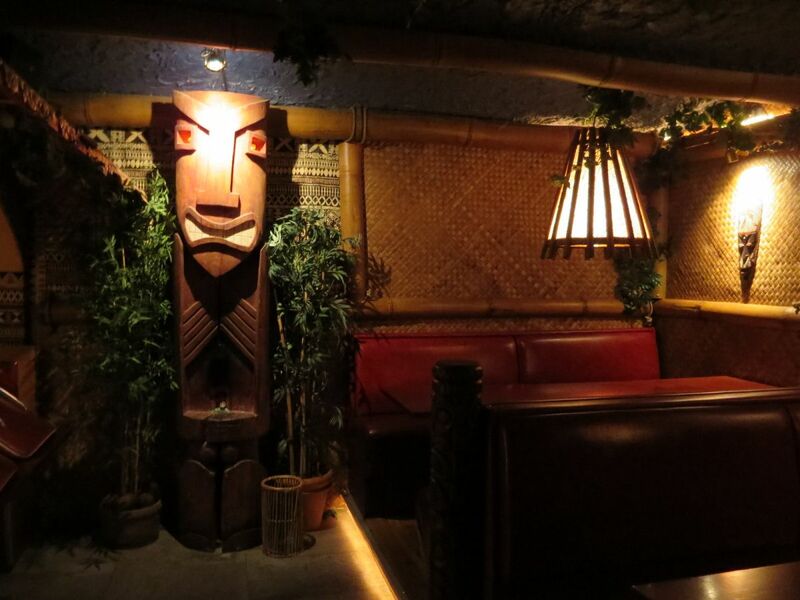 The patio was nice, but we came for the tiki bar. 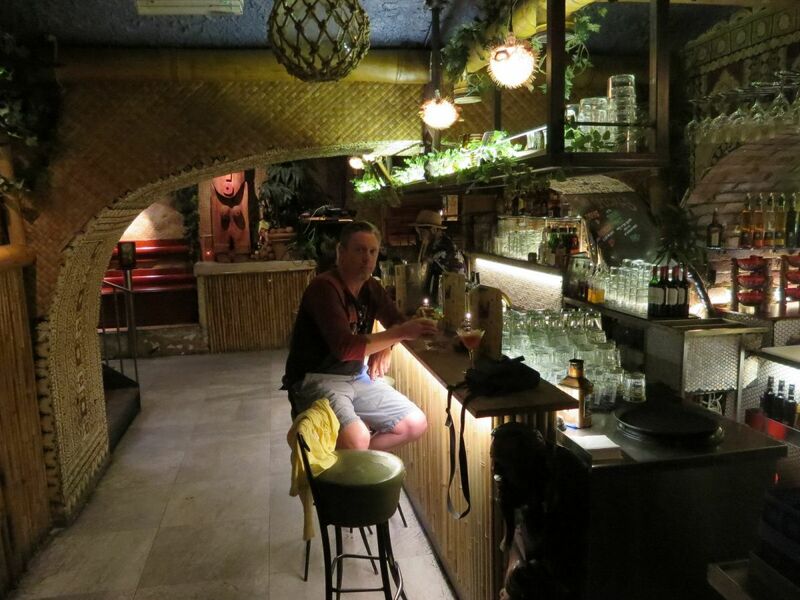 We ordered some drinks downstairs in the tiki lounge area and chatted with the bartender. Since we were in Stockholm, the drinks were pretty ridiculously expensive. At $15-$20 a drink, we could really only afford to try one each. The drinks were very good, however. 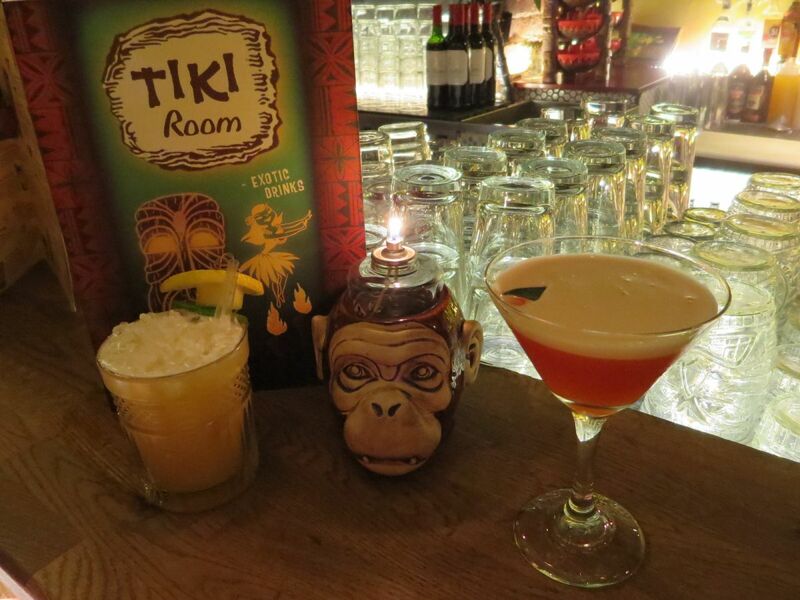 Tiki drinks are often made a bit too sweet, but these were perfect. I had the Red Tide, which I really enjoyed (and wished I could have tried another one). The bartender was super friendly, and after talking to us for awhile, he ended up only charging us for one drink (sweet!). 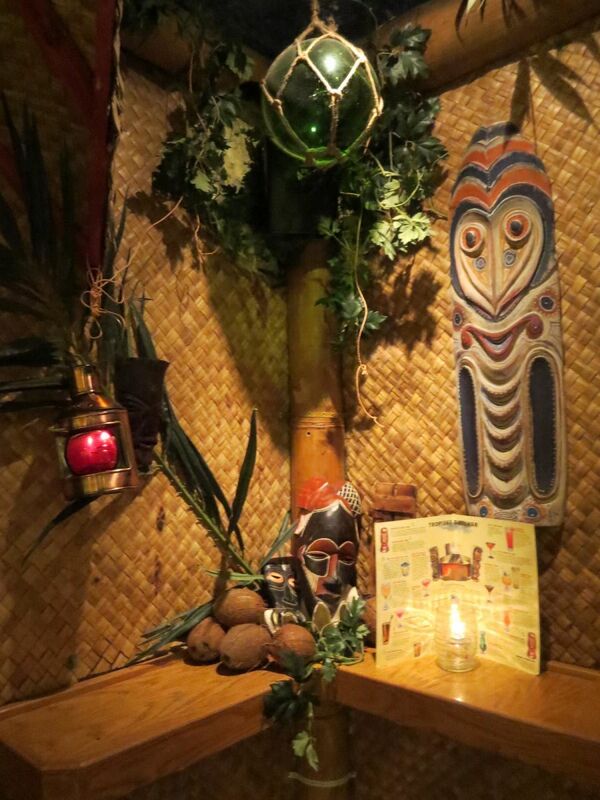 The Tiki Room was a pretty classic-style tiki bar, very nicely done with a lot of attention to detail. There was a private back room area that I assume you can reserve for parties. 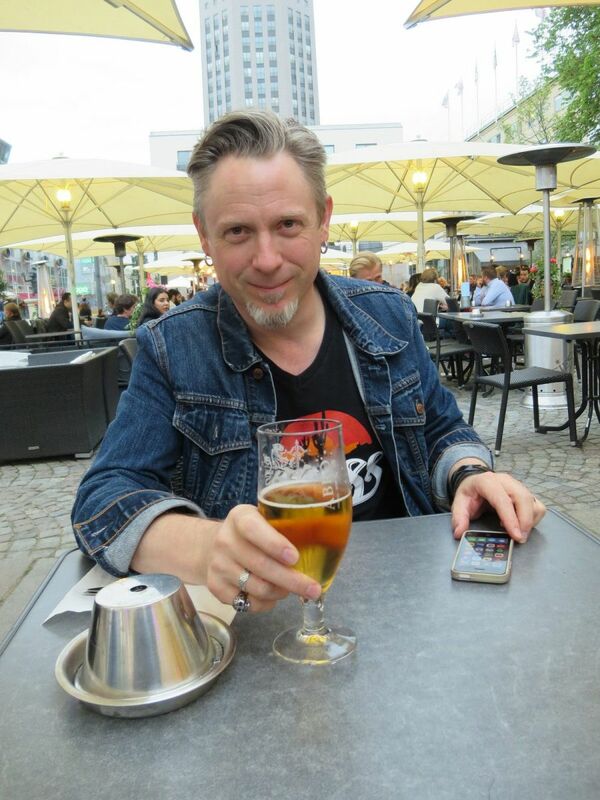 We would have loved to explore some more bars in Stockholm, but the cocktails were just too pricey. The Vasastan neighborhood was lively with people enjoying dinner and drinks at various restaurants, but most of the shops had closed by 6:00 PM. We walked around a little before heading back to the T-Bana train. Overall, we had a great four days in Stockholm. 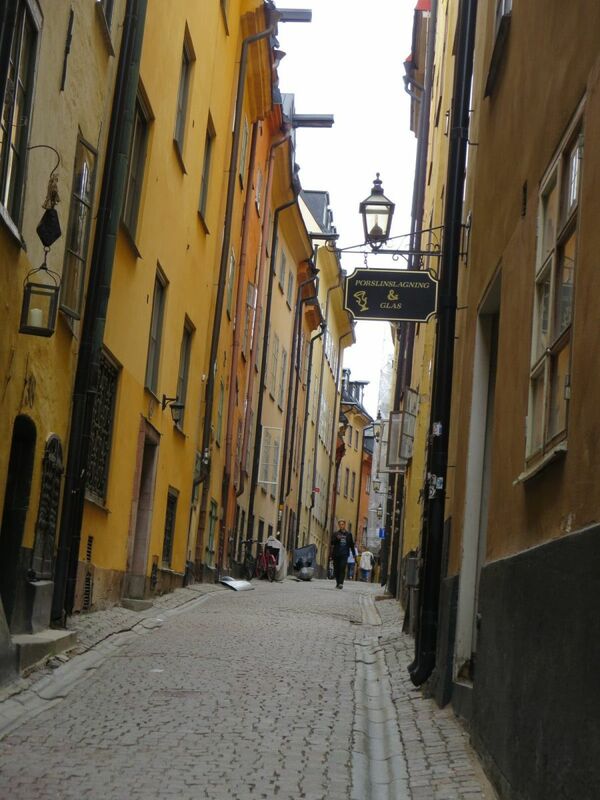 Gamla Stan was definitely a highlight, with it’s old buildings, cobbled streets and cute little alleyways. Stockholm isn’t the best place to visit on a budget, so if you don’t have a lot of money to spend you won’t be going out much. Nice dinners and nightlife are not something that should be on your agenda if you need to be frugal. There are many things to do and see during the day, however. 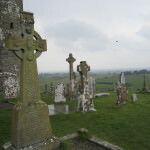 If you visit during the summer, there are lots of parks and places to enjoy a picnic in the evenings and the sun doesn’t go down until after 10:00 PM. If we were to return to Stockholm again, I would like to explore the Stockholm Archipelago and take a day trip to the ancient viking town of Sigtuna to look at the ancient viking rune stones.